This year’s Big Trip was VERY BIG. 17 days long and 2600 total driving miles to be exact. We were not as ambitious as previous years, and planned to get 2 of the last 4 resorts on the list in Colorado done. 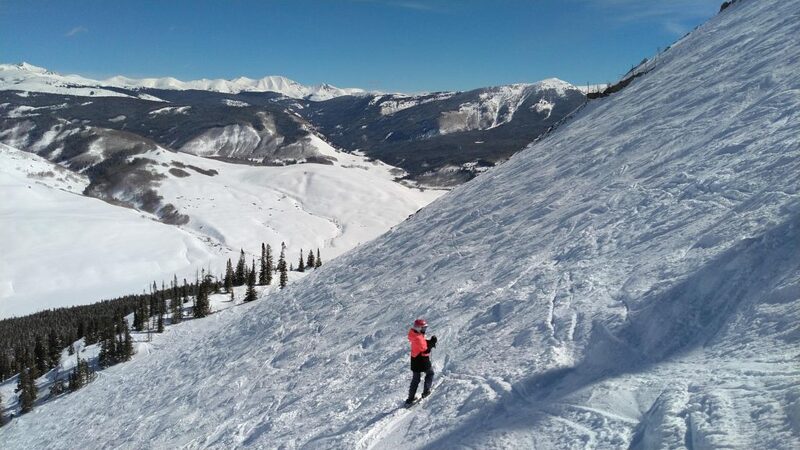 We also want to revisit one of our top 2 favorite resorts: Telluride. And then, last minute, we threw in Park City on the way home. Planning for this trip started last summer when we upgraded our passes to Vail’s Epic pass, which includes Crested Butte and 5 days at Telluride. We were banking on the weather patterns favoring southern Colorado this year with the long-term climate forecast models pointing towards El Nino. Although the El Nino never materialized, pretty much every state in the Western US had well above average snow anyway. We hit some of the best conditions of the year everywhere we went. We started the trip in our own backyard in Tahoe, Heavenly. I had the best run of the DECADE on the very first day. Tahoe had the biggest February for snowfall on record. And it was also very cold with the snow line was all the way down to 2,000 feet or so. This gave me a once-in-a-decade chance to scratch off another bucket list item: The “Minden Mile”. 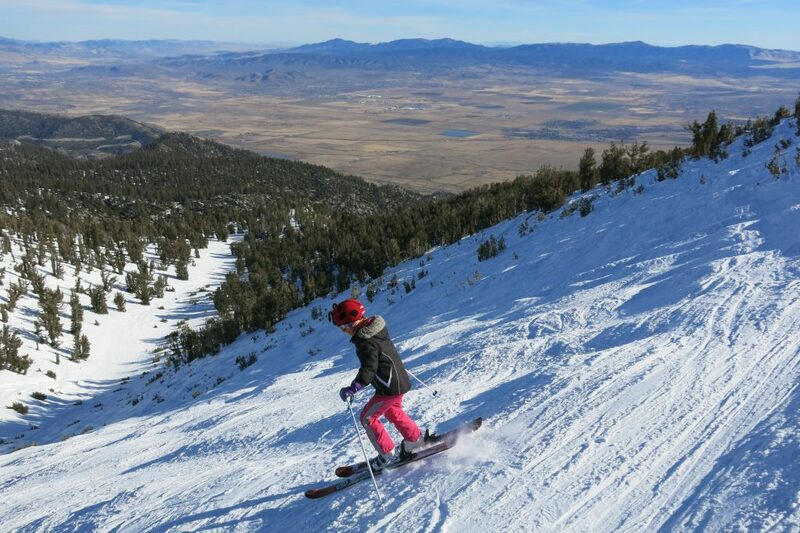 The “Mile” is a 5,200 vertical drop run from the top of Heavenly to the town of Minden in the Nevada desert at 4,800′ elevation. It’s rare that snow sticks for more than a day or so down there. 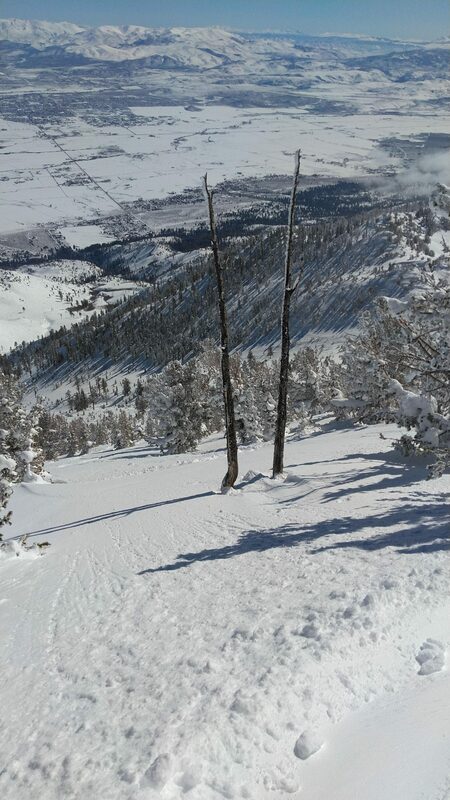 However, it was deep and cold enough to enjoy powder turns all the way down. It was incredible to have that kind of a huge vertical drop run outside of Canada or Europe. 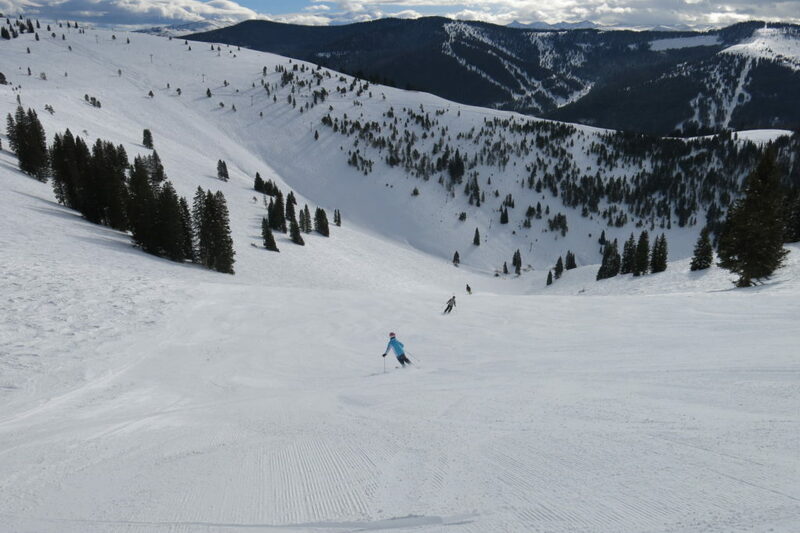 Next we drove 760 miles to Grand Junction Colorado to ski one of the smaller Colorado resorts: Powderhorn. We met up with Tom and Nancy Johnson who are friends of one of AiRung’s clients. They have lived in Junction and skied Powderhorn for the last 2 decades. Tom is a patroller there and we got a great tour of this really fun and unique resort. We will post a full review later this summer. This resort is another great find that we never would have skied without the project, and one we are certain to return to. Grand Junction is a pretty great town as well, with a nice walkable downtown with shops and restaurants. Another thing we liked about Grand Junction and Powderhorn is that the town is at only 4,600′ elevation, so it’s easy to get a good night’s sleep. This is about 5,000 feet lower than where we stayed later in Telluride and Mt. Crested Butte. We always have trouble sleeping at those high altitudes, so the option to ski Colorado but stay down low is attractive. We continued on to Telluride after Powderhorn. As before, we really enjoyed the steep groomers and views. 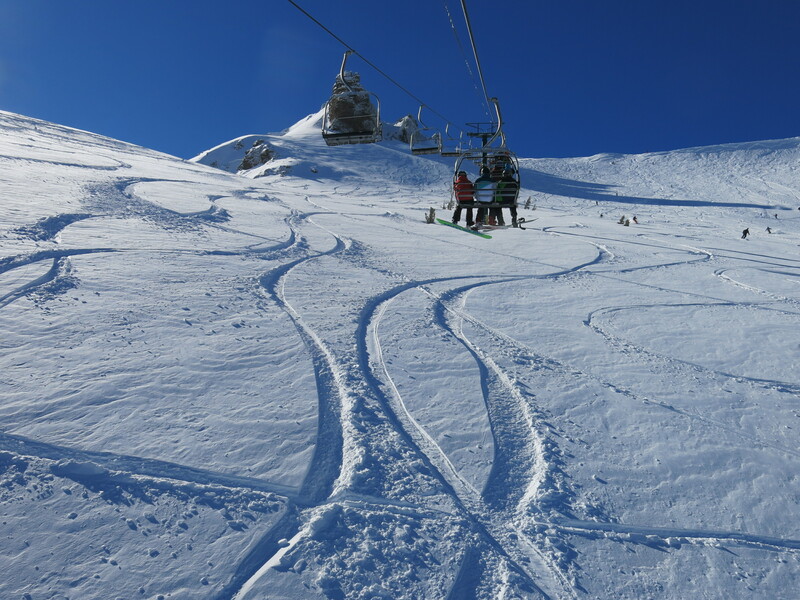 This time we also got 2 powder days out of the 4 dyas we skied to experience the whole package! Our next stop was Crested Butte. I lived in Gunnison and Crested Butte for 8 years, first as a student attending Western State College, then as an employee of the resort. So it was a home-coming for me. I left Crested Butte 26 years ago and had not been back in all that time. The changes were huge. But this was AiRung’s first time here and I got to show her around some of my favorite places. We had 3 days there with fresh snow every day. The skiing was the best I’ve ever seen in Crested Butte, considering I had 8 full seasons of skiing CB as my home resort. 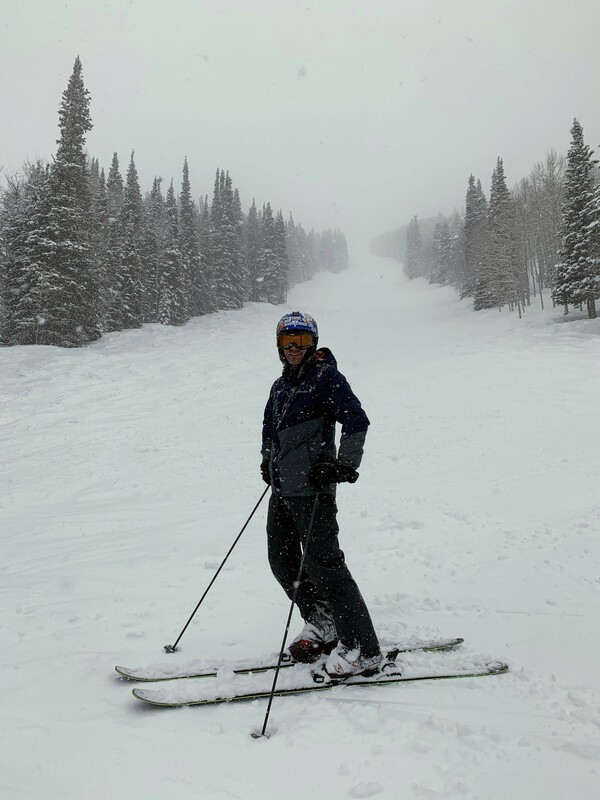 In fact, from the last 2 days at Telluride to the day we left Colorado a week later, it never stopped snowing for long. 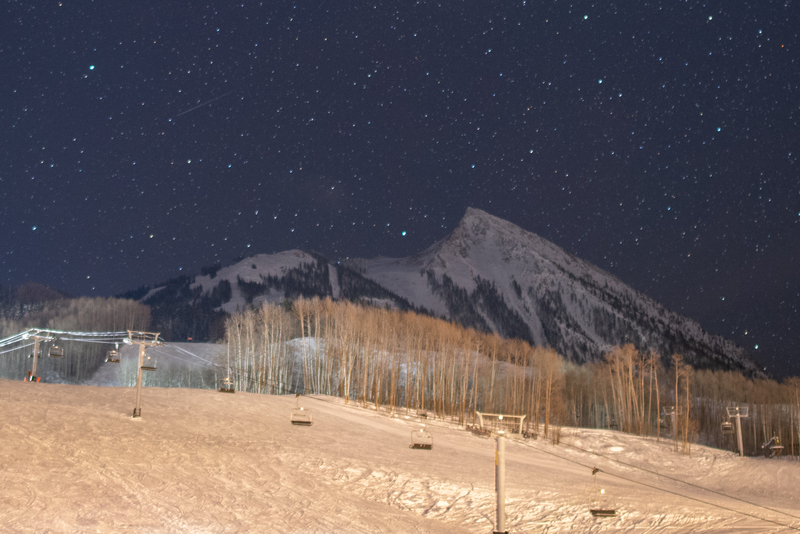 Crested Butte has some of the most impressive steep terrain in North America and every skier who likes steep terrain should give it a try. To break up the long drive back to South Lake Tahoe from Crested Butte, we added Park City as a “stop” in between. 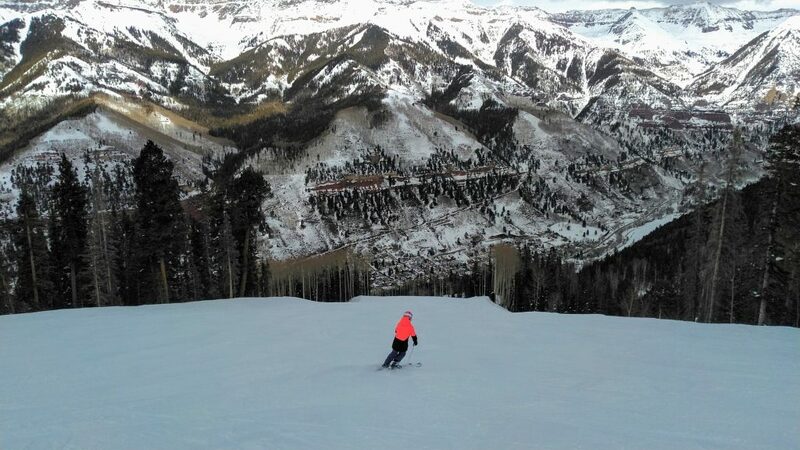 With only one day to ski, we picked our favorite side of the resort, The Canyons. We used to go there every year to ski the massive amount of terrain,except last year. So it was time to go back. 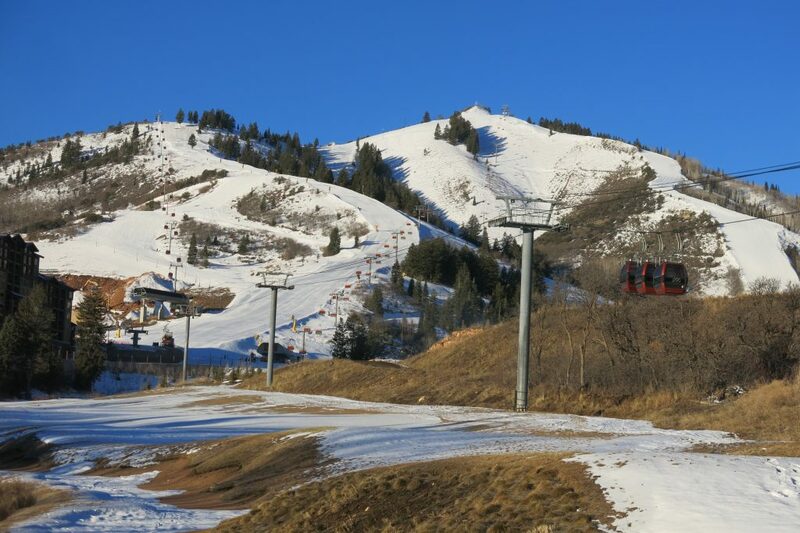 This year Vail has upped their grooming game at Park City, claiming the most nightly groomed terrain in North America. 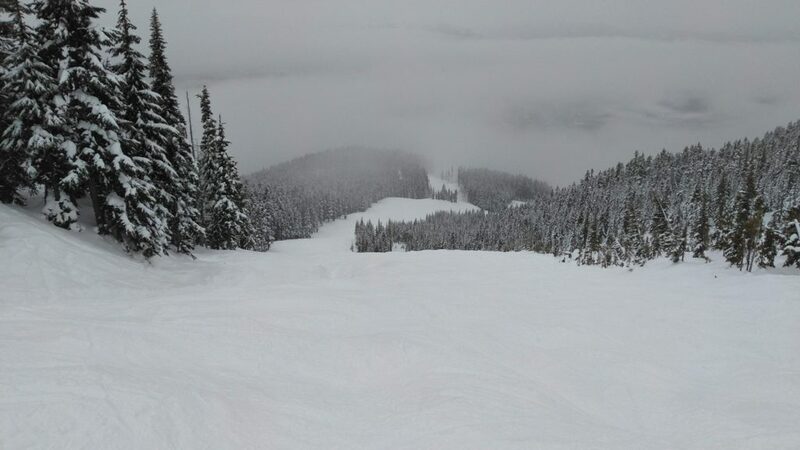 Conditions were great with lightly falling snow all day. 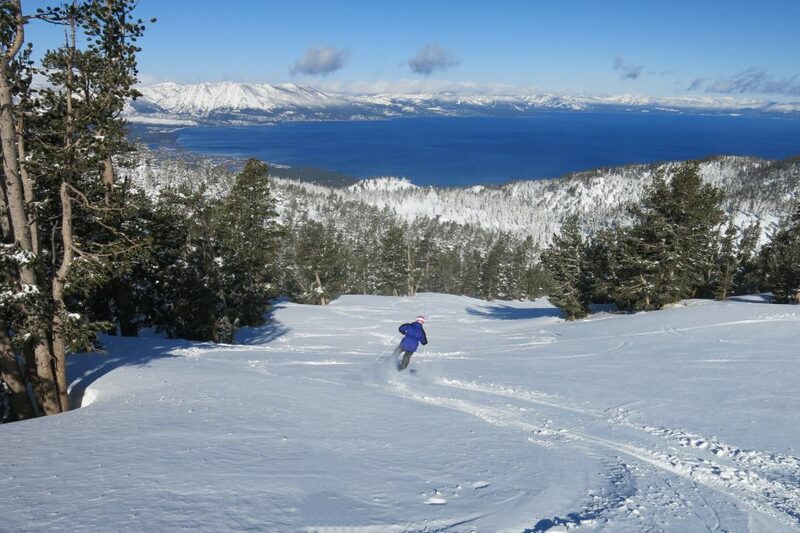 As of this writing in early April, it’s still snowing in Tahoe and Heavenly has extended their season until Memorial day, so we still have almost 8 weeks of skiing left! With 51 days thus far for me and 38 for AiRung, this will certainly be the most ski days we’ve ever gotten in one season. This entry was posted in Uncategorized on April 4, 2019 by Ron Thompson. 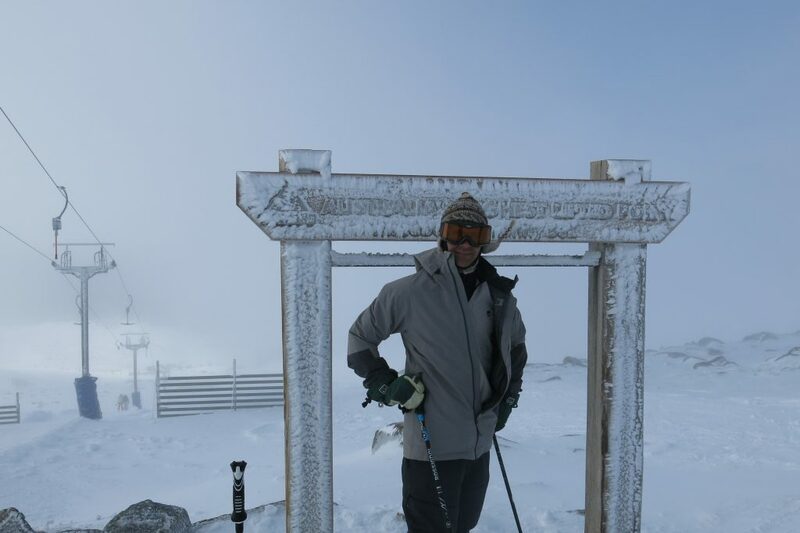 Our 3rd trip of the year began to take shape when Vermont got pounded with early season snow in November, while we were in dry, smokey California reading about firestorms and waiting for snow in Tahoe. 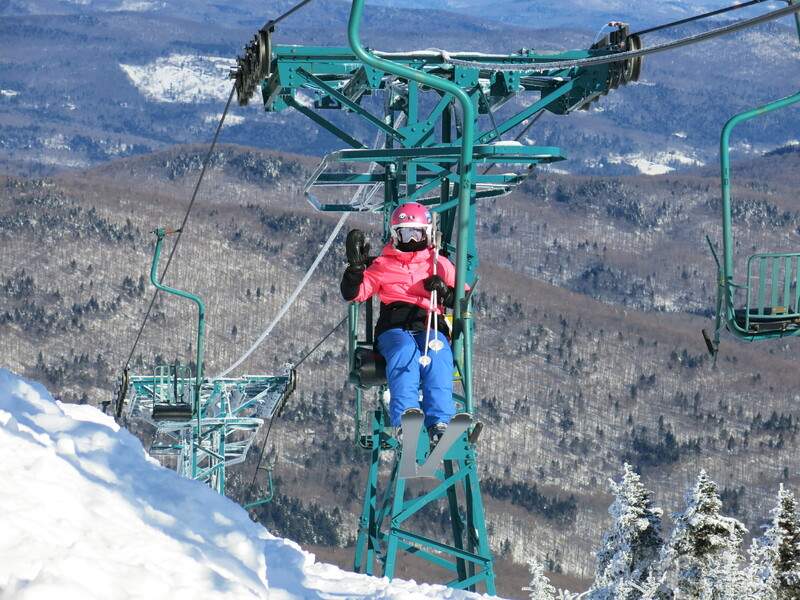 With our full Epic passes this year, we got “free” skiing at Stowe, VT. So we decided to squeeze in a trip to knock off 3 of the best Vermont areas: Stowe, Sugarbush, and Mad River Glen. The only time to do it was early January because of our other commitments. And there were two big risks we were taking: extremely low temperatures and winter air travel with connections. Luckily it all worked out, and more. Our flights were a non-event. And after a month of no snow and lots of rain, Vermont got their biggest snowfalls of the year in the 2 days before we got there. When we were landing in Burlington, we heard a returning local complaining: “I can’t believe how much snow fell while we were gone. Yuck!”. We were loving it. Our first day at Stowe featured 8″ of fresh on top of 16″ the day before that. The only problem was the temperatures and wind. It was -10F at the Mt. Mansfield weather station and was blowing 50mph, which is a wind chill of -45F. That is serious danger territory, where skin freezes in 5 minutes. We had double face masks with absolutely zero exposed skin. The problem is breathing because you have to breath through the fabric and your goggles get fogged. Everything becomes difficult at those temps: Skis don’t slide well, goggles are fogged, fingers frozen so badly that you can’t operate a camera or phone (which are dead anyway because of the cold). Taking your gloves off for a minute for a picture is a painful experience. Chemical hand warmers are an absolute necessity. Every picture on this page was taken at great expense and personal torture! Oh, but the skiing was great! No crowds, everything was open, and soft snow almost exactly the quality we see in Tahoe…pretty much as good as it gets in the East. By the 2nd day we were more used to it and started to really enjoy ourselves. We skied about 90% of the named runs at Stowe over 2 days, including the VERY steep front 4 runs: Starr, Goat, National, and Liftline. I have to give the scary nod to Starr, which was an absolutely smooth slippery slope that you would NOT want to fall on. I wouldn’t exactly call it ice, but it was as close to ice as is possible to get an edge into. The lower part was fantastic though, as were the others. 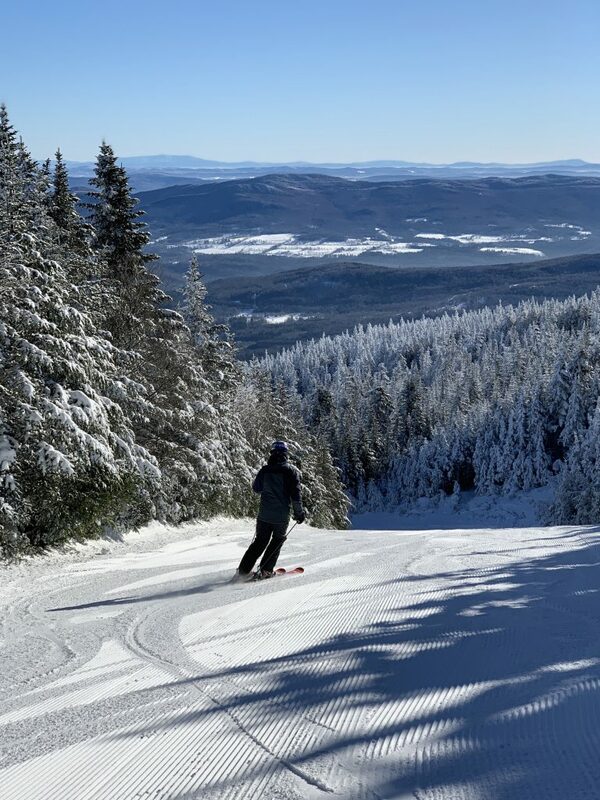 This was a bucket list item for me because we used to ski Stowe regularly when I was a kid growing up in Buffalo, and I always looked at that run as something to aspire to be able to ski. Mission accomplished 42 years later! After 2 days at Stowe, we moved on to Sugarbush. Sugarbush is a larger resort spread over 2 distinct ski areas connected by a lift that was NOT running when we were there. That meant that in order to get the full resort experience we had to get in the car and drive over from the Lincoln Peak side to the Mt. Ellen side. 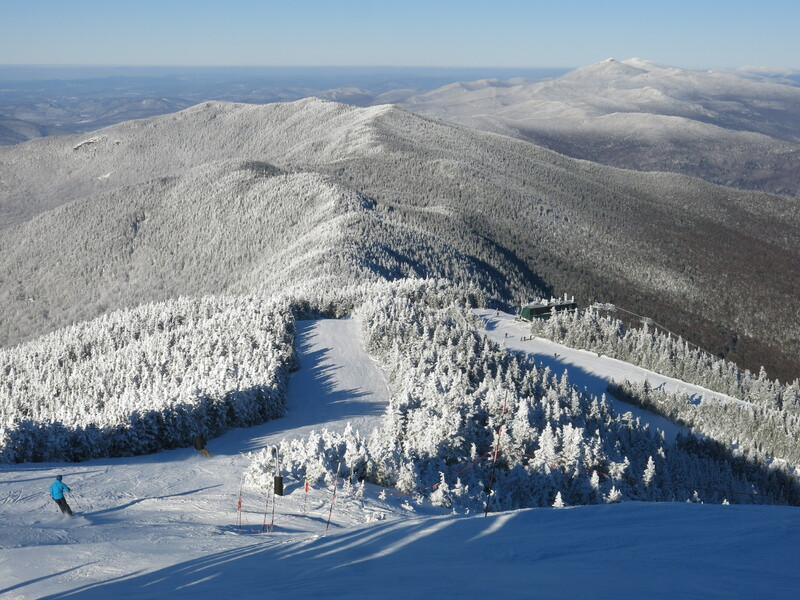 Both sides of Sugarbush are great with a distinct character and plenty of advanced to expert terrain on both. We would have liked to have spent more time there. The last day was at Mad River Glen. The last time I skied there was in the mid 70’s. It hasn’t changed much. This is one of North American skiing’s historic places, and it is a truly unique experience. 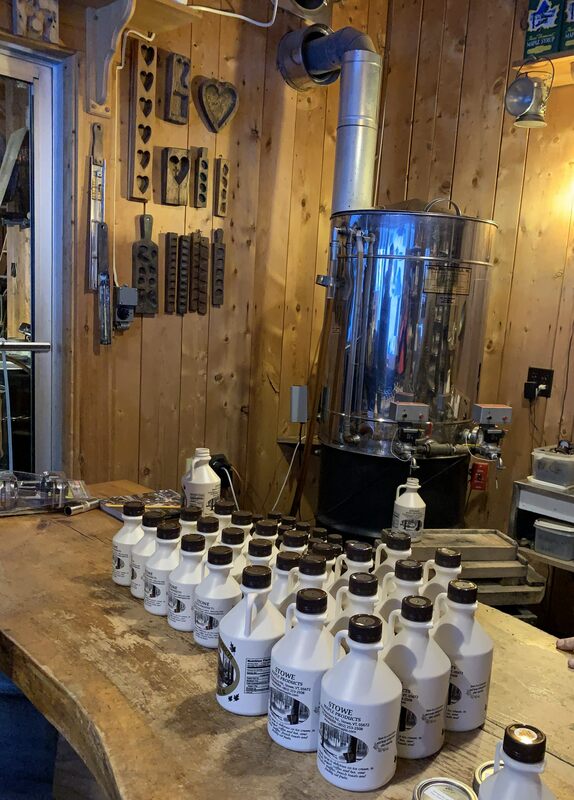 If you ask people you meet at Stowe or Sugarbush what their favorite Vermont resort is, they might say it’s Mad River Glen, and nobody can really put their finger on why that is exactly. We think the 1948 single chair is a big part of that, being the only single chair remaining in regular operation in North America. Mt. 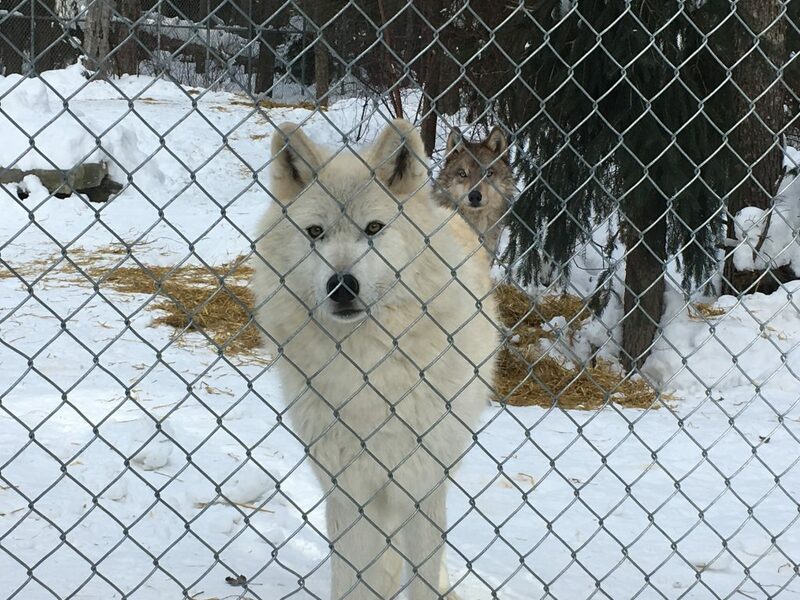 Eyak in Alaska still runs a single that was purchased and moved from Sun Valley, built originally in 1939, but it only runs a few days a year. Mad River Glen features what is often rated as the most difficult run in the East: Paradise. Although not super steep by Western standards, it’s full of ice falls, rocks, and tight trees and believe me it will be a serious challenge getting down that with intact dignity at the bottom. There are better runs there though, and we ended up skiing about 75% of this small resort. There were a total of about 20-30 people skiing that day so we felt like we had the place to ourselves. It was a surreal experience and I recommend it to every skier that wants to experience what skiing used to be like. We always learn something new after our ski trips. Because of our really positive experience with this trip, we gave some more thought to what it is that makes a resort stand out. We decided that, while snow and acreage are important, what really makes a place for us is vertical drop. So we made some changes to the 100 list. 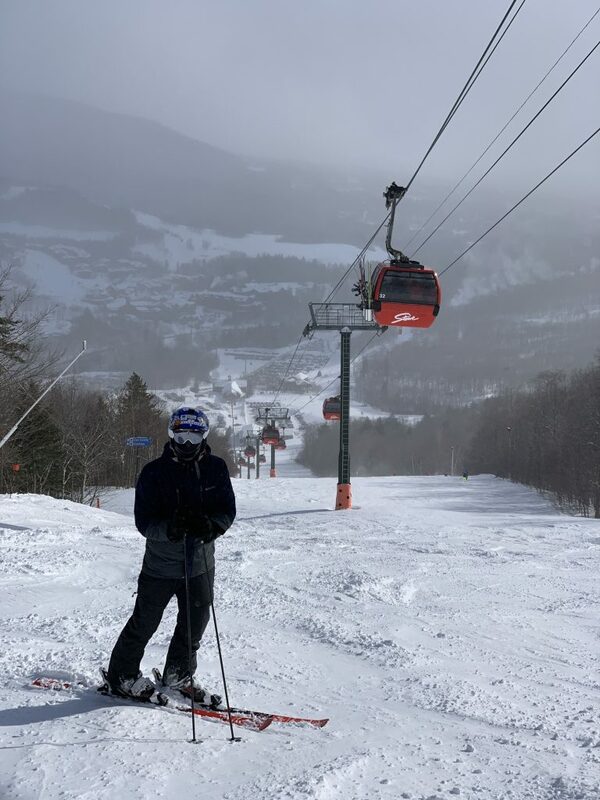 We have added back Whiteface, New York, which has the biggest vertical in the East, and Sunday River, Maine which is a huge, popular resort that everyone keeps telling us must be on the list. Removed were Eldora and Monarch Colorado which are at the bottom of the list for vertical drop and fell under the 1,400 vertical lower limit. 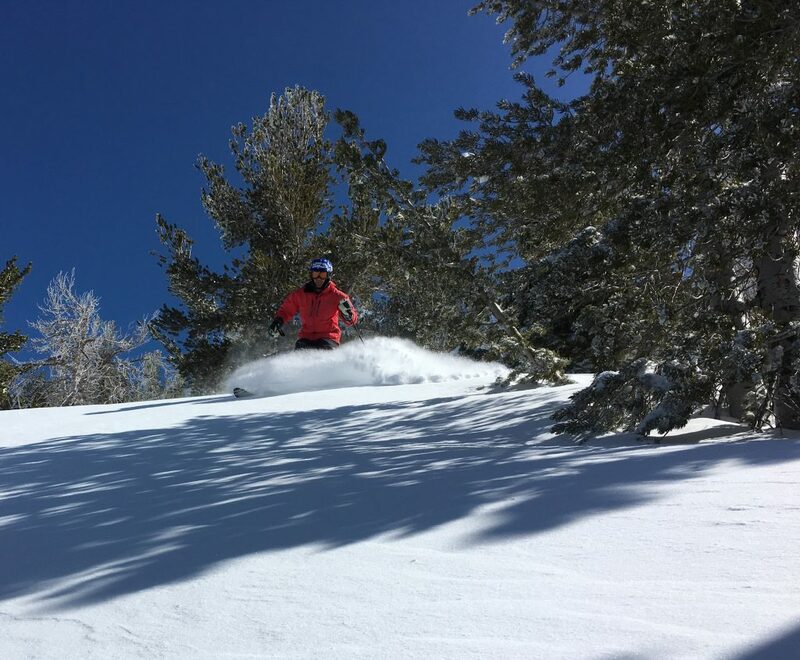 We also removed Brian Head, Utah which has a real continuously skiable vertical of only 1,100 feet to make room for Tamarack, Idaho, which was added back because they are re-installing one of the vital lifts that was removed when the resort was foreclosed on 10 years ago. 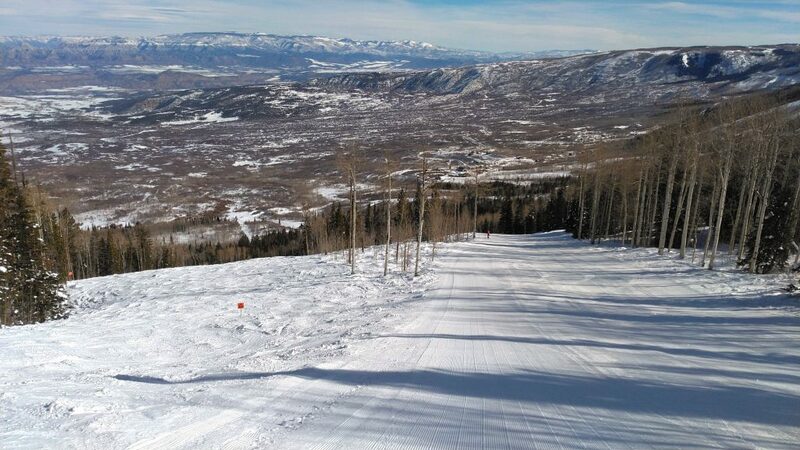 We had previously skied Brian Head so after all this shuffling we are back to 76 resorts completed. Lots of thought has gone into the list and we think it’s pretty close to final now. We may make more changes later as we finish the last 24. 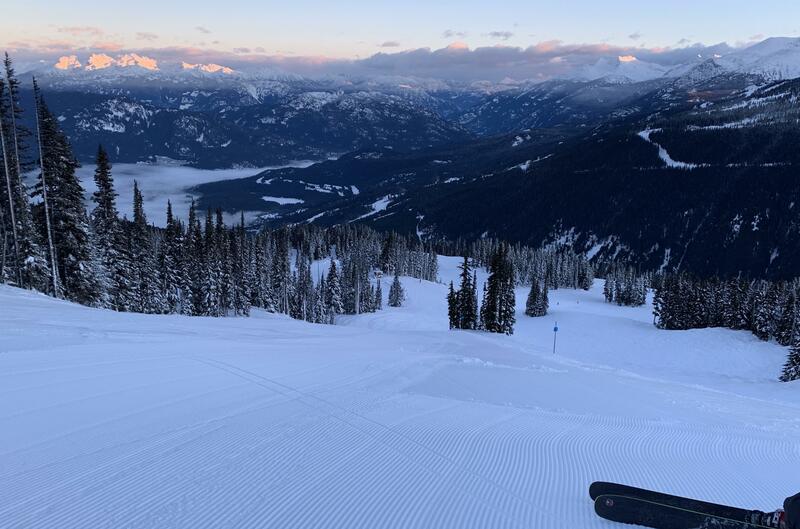 There are also 2 new resorts being planned in British Columbia that may need to be added to the list if they are built in time: Valemount and Garibaldi. These will be huge resorts and when complete will rival many of the best resorts on the list now. This entry was posted in Uncategorized on February 18, 2019 by Ron Thompson. 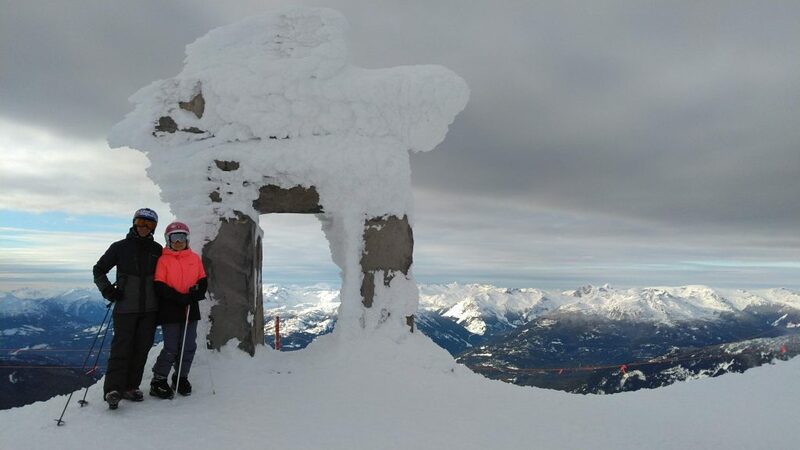 The Whistler Christmas trip was our 2nd of the the 2018/19 season. This year we decided to get full Epic passes for Vail resorts which gave us access to Whistler/Blackcomb over the Christmas holidays. We have been there twice before in the winter and spring and never had good conditions so we wanted to give the biggest resort in North America another shot. We’ve had good weather luck on this project over the years, but you can’t win them all. Whistler is prone to rain on the lower mountain and that is what we got. Good snow and 4″ of powder the first day was replaced with all-day rain 2/3 of the way up the mountain on the 2nd day and all of the upper mountain lifts closed due to wind. Ahh! This is the worst possible weather when skiing because skis don’t slide on water. We also found out that our waterproof ski clothes aren’t really that waterproof. We just barely got them dried out in time for skiing the next day. On the third day we did the First Tracks breakfast which gets you on the gondola in the dark and up top long before sunrise. After a good breakfast we got to ski the upper mountain before the hordes of holiday skiers got up there. This was one of the highlights of the trip along with a great dinner at Ka-Ze (Japanese) in the village. So the Whistler Christmas trip was interesting and fun, but our opinion of Whistler isn’t really improved or changed much. It’s risky planning a trip far in advance there, but if you hit it on a good day it’s pretty amazing. This entry was posted in Uncategorized on January 27, 2019 by Ron Thompson. We are excited to start on the 7th full season of the Ski North America 100 project and 18th year accumulating resort visits to the top 100 ski resorts in North America. Somehow we are already 75% of the way finished, but we still expect the project to take another 5-10 years to finish all of them. 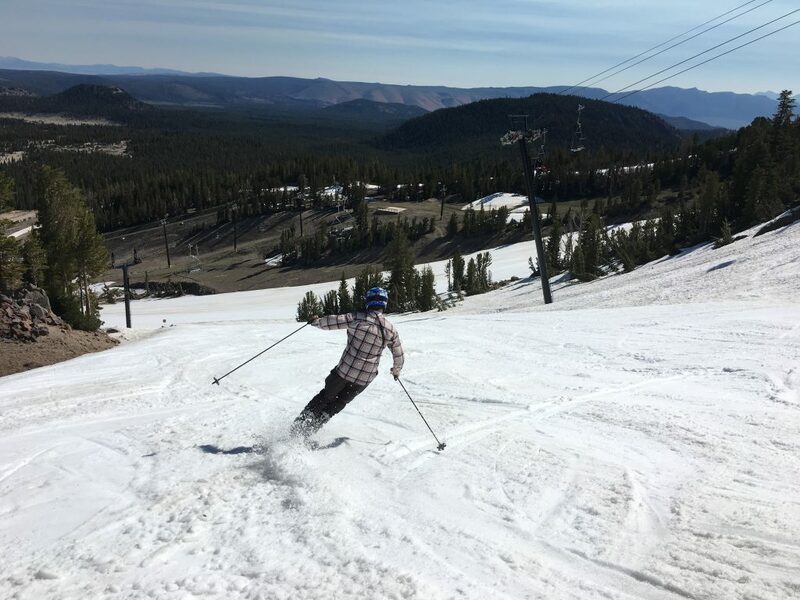 The season started off strong in Tahoe with our first weekend of skiing on the last day of November featuring a blizzard at Kirkwood and bluebird powder skiing at Heavenly. 2 weeks before, we were hiking in pleasant summerlike temps at 10,000 ft thinking that we would be lucky to ski anything in early December, but things change quickly in Tahoe and the switch from summer to winter was just in time. This year we have 4 trips planned in addition to our usual Tahoe skiing. We just returned from the first trip to Vail, Colorado December 8-11. This trip was planned in mid November because Colorado was getting good snowfall. The snow kept coming and it snowed every day for 11 days up to and including the first day on the mountain. This resulted in our best trip to Vail EVER. No crowds, everything open, and the great weather was unbeatable. 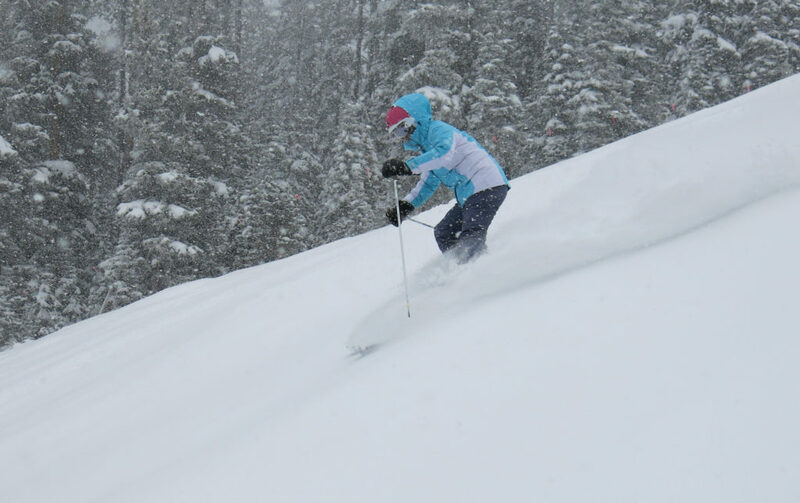 Our favorable opinion of Vail as a 5-star resort was further improved. Although the skiing there is not very challenging, the quality of the lift network, grooming, and facilities are at the very top of all of the resorts on our list. 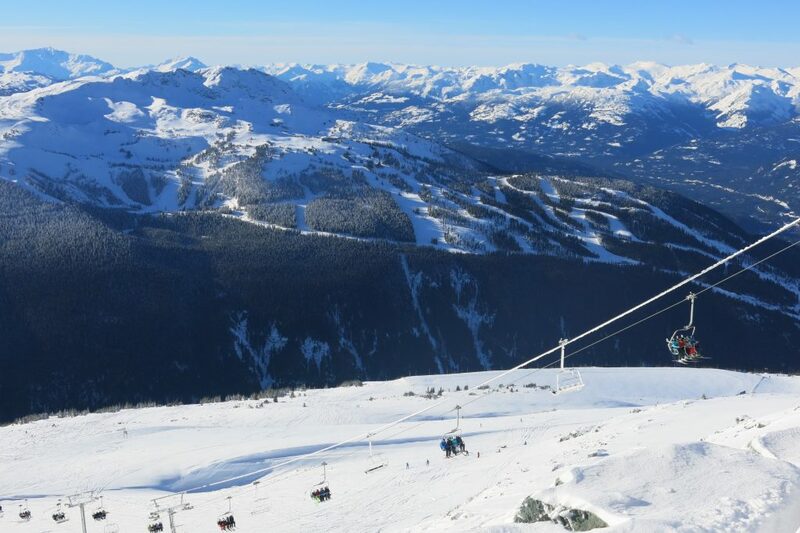 Next up we are giving Whistler/Blackcomb, British Columbia another shot. This will be the 4th time we’ve been there. This time we hope it doesn’t rain and everything is open! After that, we are continuing our focus on the East Coast with a trip to Burlington, Vermont to ski Stowe, Sugarbush, and Mad River Glen. 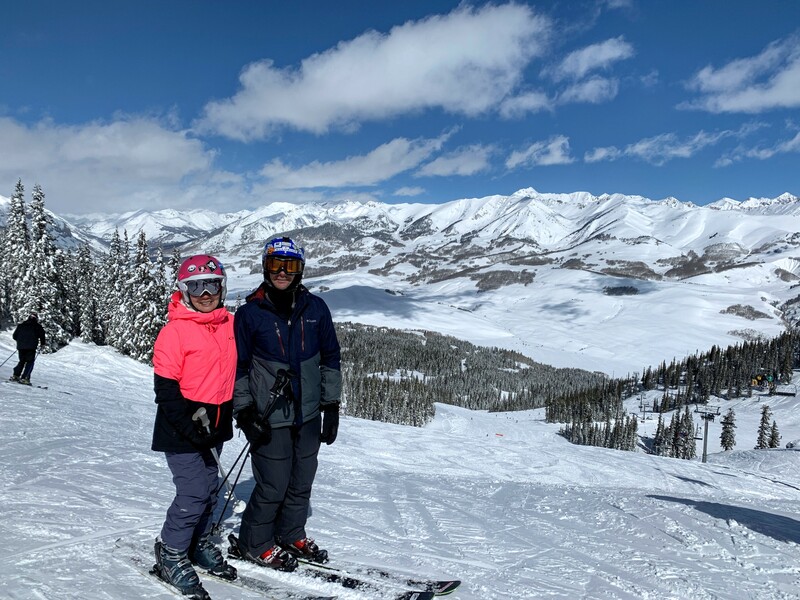 Lastly, we will head back to Colorado again to ski our favorite resort Telluride and also my old hometown mountains Crested Butte and Monarch. If it all works out, we will ski 5 new resorts this year, and plenty of our old favorites. It’s on! This entry was posted in Uncategorized on December 17, 2018 by Ron Thompson. 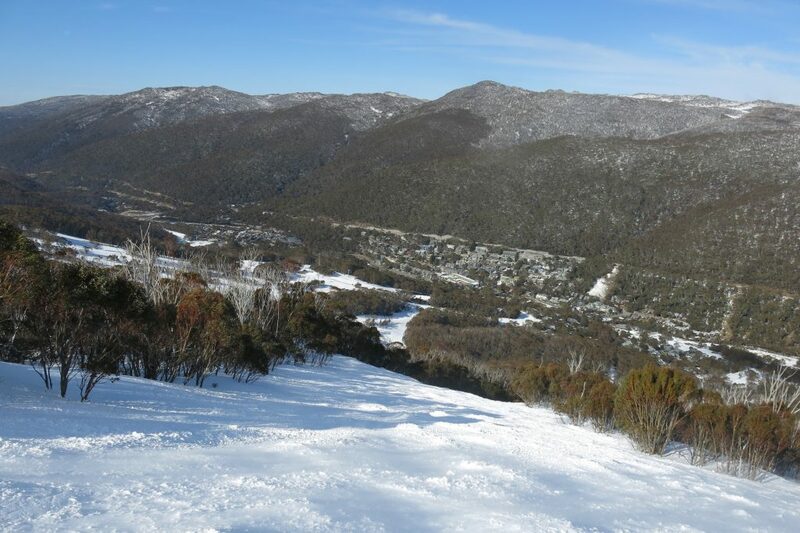 This summer I got a chance to check off one of the items on my bucket list — skiing in Australia! My daughter lives in the Outback in Alice Springs has been there for 1 1/2 years, so it was time for a visit. Since it is such a long journey I decided to take a few extra days to see Sydney and to go skiing in the Snowy Mountains. AiRung couldn’t make it on this trip unfortunately. 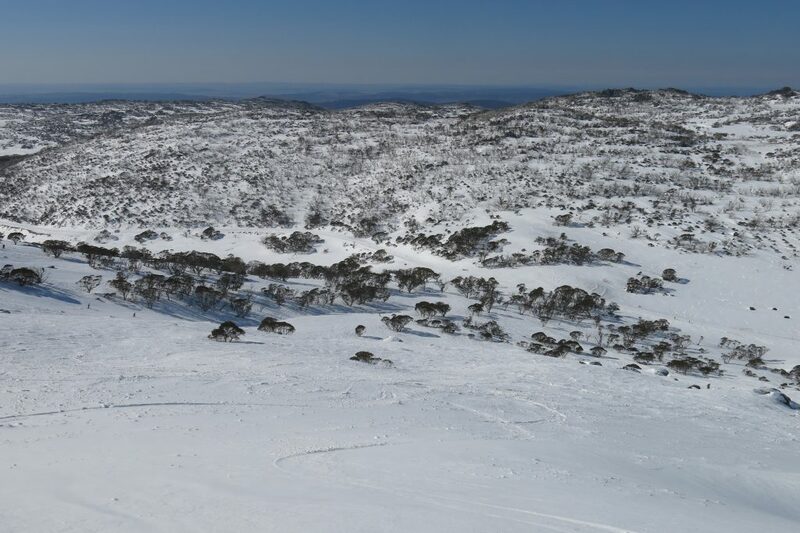 After looking at the map and logistics and talking with Jack at Snowpak.com, I chose to ski Thredbo and Perisher. 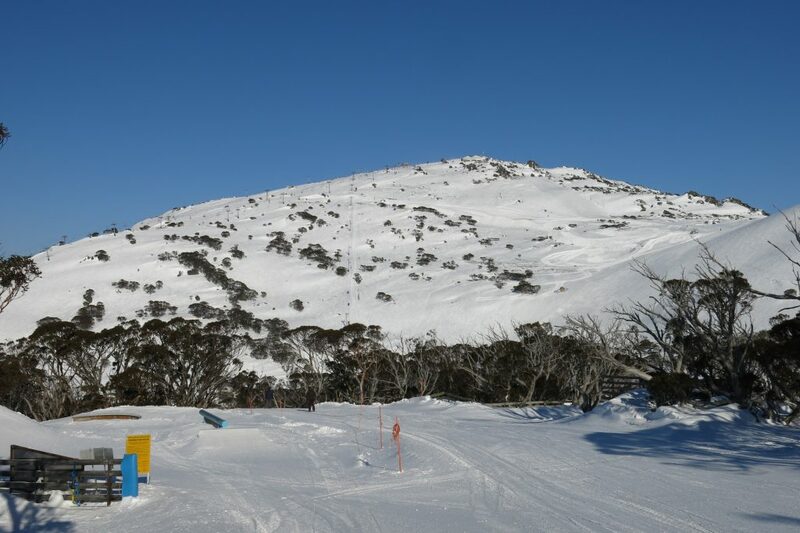 Jack rated Perisher as #1 and Thredbo as #3 in his article here: The Best Ski Resorts in Australia. I spent most of Sunday driving from Sydney to Jindabyne, which is the closest town to both Thredbo and Perisher and a great spot to spend a couple of nights with lots of restaurants and bars, and the largest per-capita number of ski shops I’ve ever seen anywhere — over 20 for a town with a population of 2,600! Of course these shops are to serve the hordes of skiers that descend on Perisher and Thredbo. 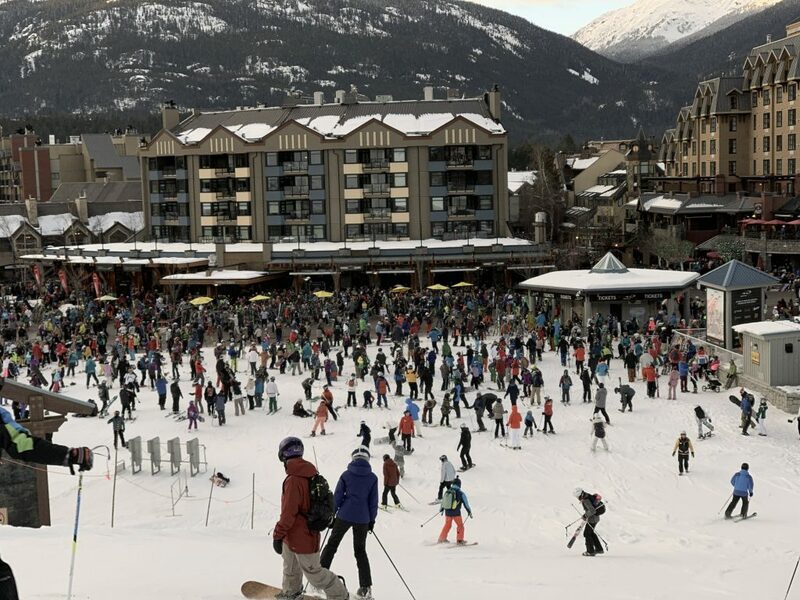 I did some digging and it looks like those 2 resorts are responsible for somewhere between 1 and 1.5 million skier visits per year, which is huge. That’s why Jack suggested that I ski on a weekday, which was great advice. 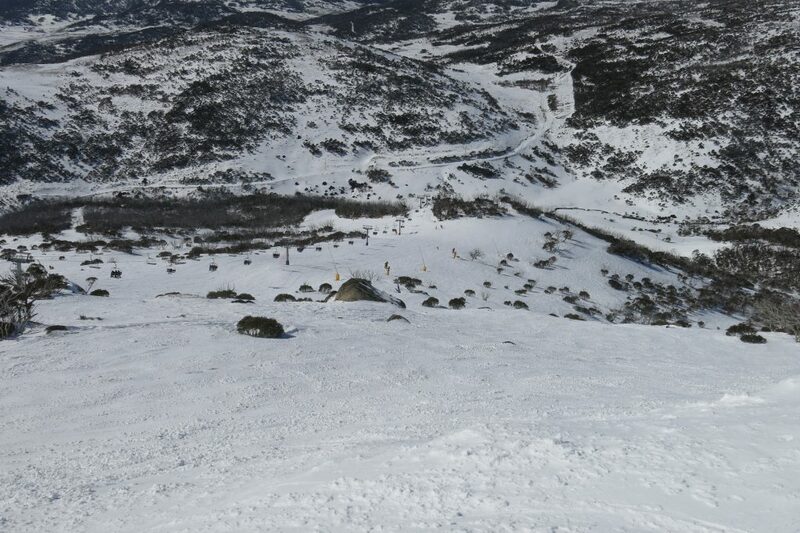 I did see lines at Perisher, but nothing too bad. 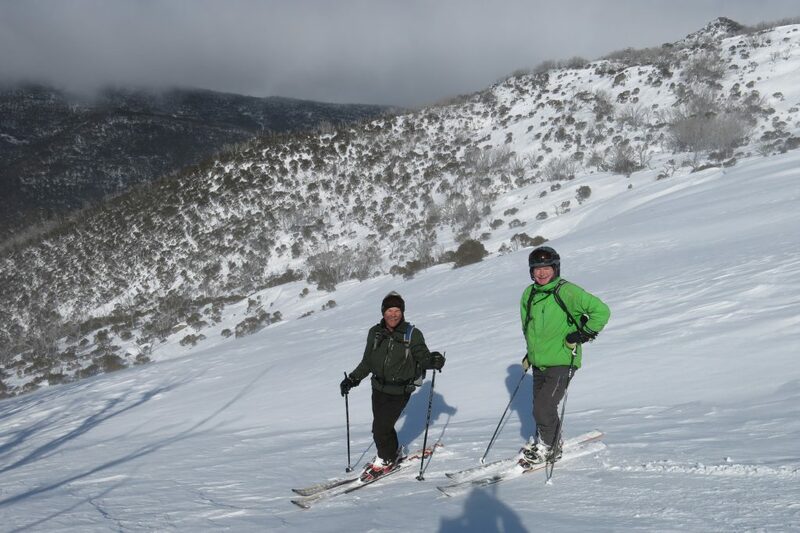 I skied at Thredbo the first day, and was super impressed with that resort. It has both the highest and lowest lift-served elevations in Australia, giving it a respectable 2,200 feet of vertical. 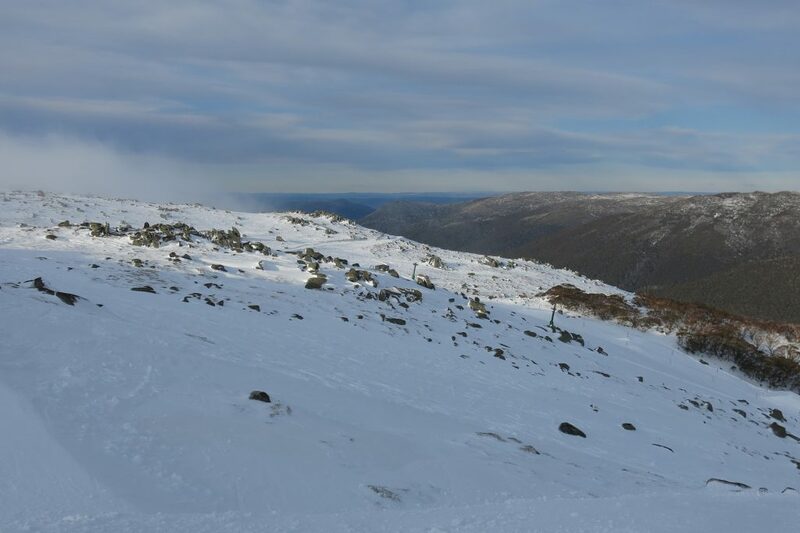 It also has a great lift network with 3 high speed quads and the best lift in Australia: the Kosciuszko Express, which has a vertical drop of over 1,800 feet. I spent most of the day on that lift. There were patches of wind-blown powder in the trees, and lots of top-bottom groomers. There is some challenge there, but nothing that could be considered double-black. 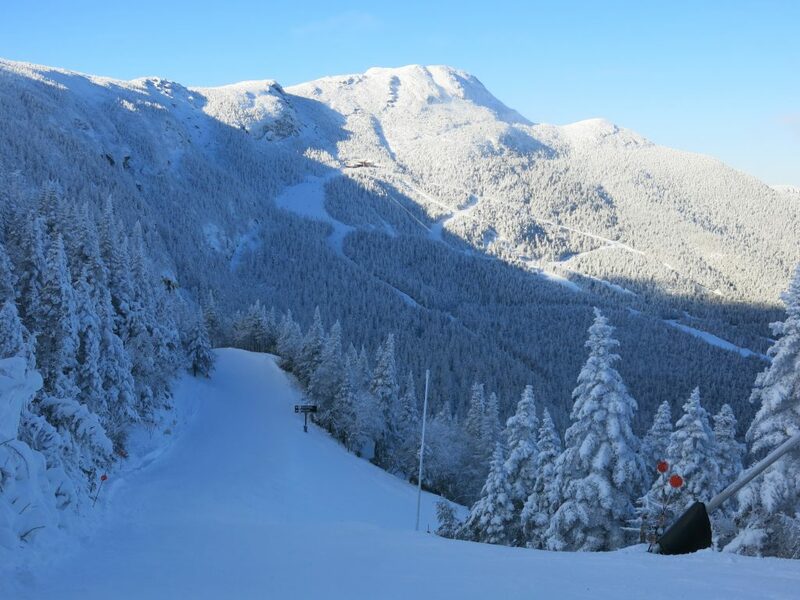 Good snowmaking coverage assures skiing even if natural snowfall is lacking. The very first chair ride of the day I met John and Graham: 2 Thredbo regulars who spent the whole day showing me around. Graham had been skiing there since the 70’s and had lots of stories and history for me. John and his wife invited me to join them for dinner in Jindy after skiing, so it was a super fun day and I got to learn a lot about the skiing culture in Australia. These 2 guys had to be the best 2 skiers on the mountain and as long as I was following them, I was skiing soft snow and powder. 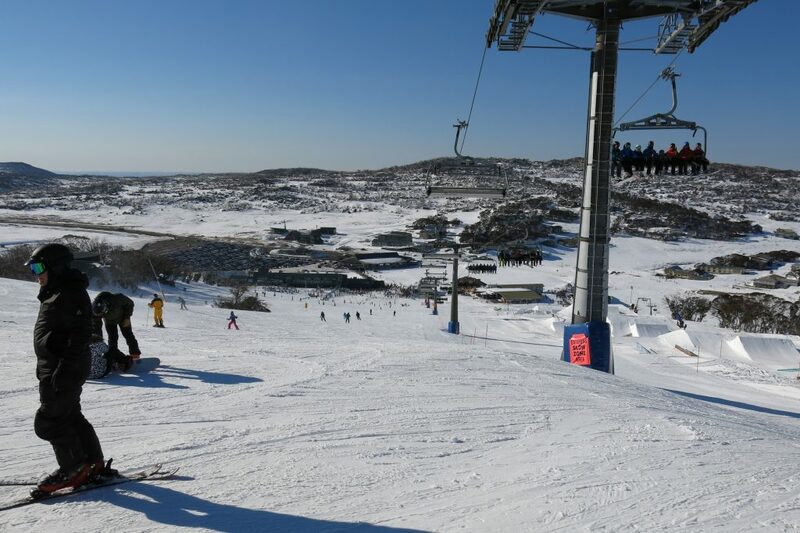 The next day I drove up to Perisher, the largest resort in Australia at over 3,000 acres. It has a higher base but has much less vertical and is mostly green or easy blue terrain. 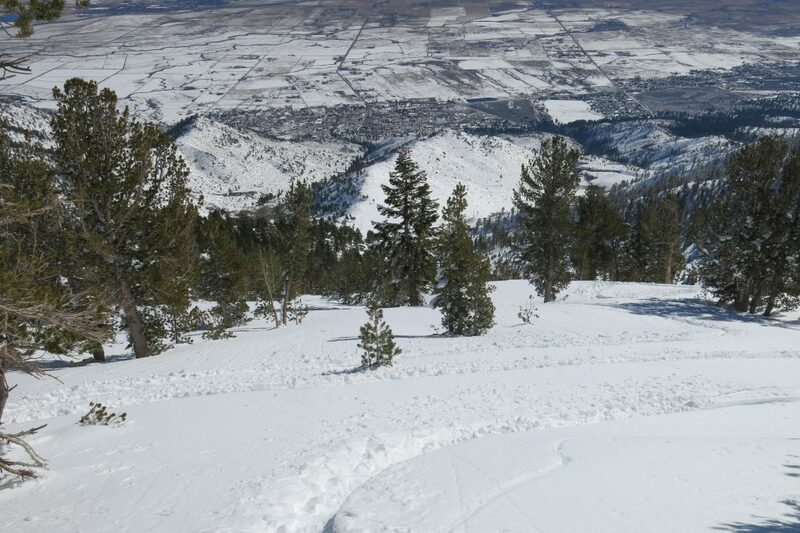 In fact the max skiable vertical there is only 1,200 ft. 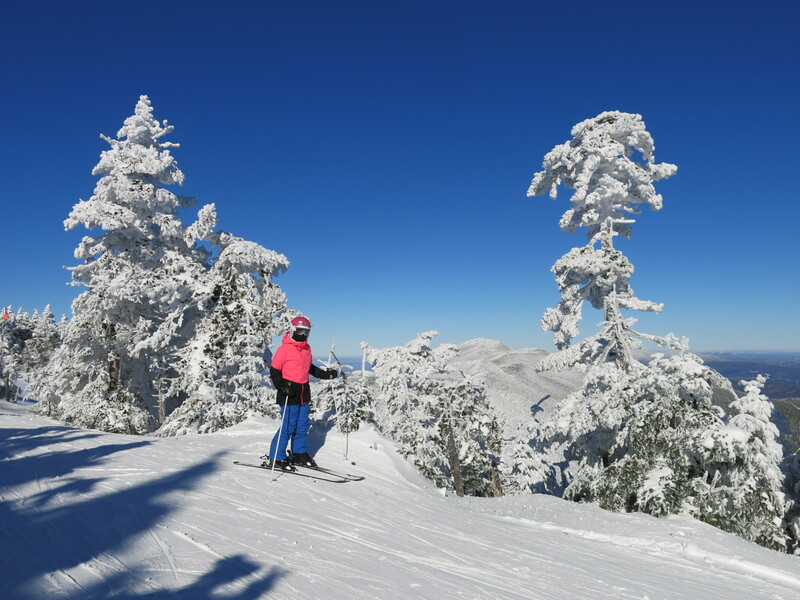 It also has only one high-speed lift which has very little vertical and serves beginners. Perisher was underwhelming but impressive in a silly way — being so flat and spread out with so many T-bars and pointless long flat chairs. I’ve never seen anything like it anywhere else. The best chair is the Ridge Quad which has some legit steep terrain on 2 trails which provided the best runs I encountered in Australia. Other than that, there was only Mt. Perisher on the other end of the resort that had decent vertical and enough slope to make it interesting. Once again, I had a friendly guide Mark who I met on one of the many T-bars early in the day who led me to the steeper stuff. Thanks Mark! Snow was excellent according to the locals I talked to, and I thought it was good even by Tahoe standards. They don’t get the depth we are used to, but all the runs were covered and I never hit a rock in 2 days of hard charging off-piste. 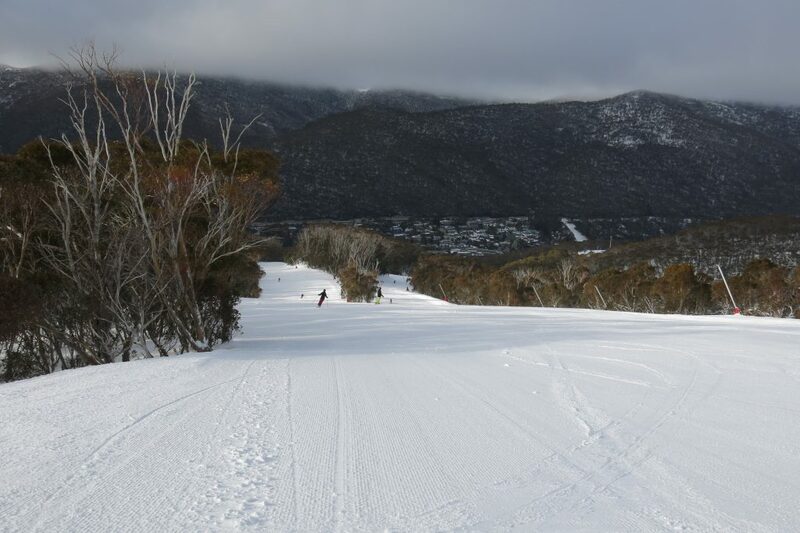 I felt like a star skiing in Australia and had a great time. Locals were very interested in showing me around and I’ve really never skied anywhere else where people were that friendly. Once I opened my mouth to speak they found out I was from California and they seemed so happy that I had made the effort to ski in Australia. 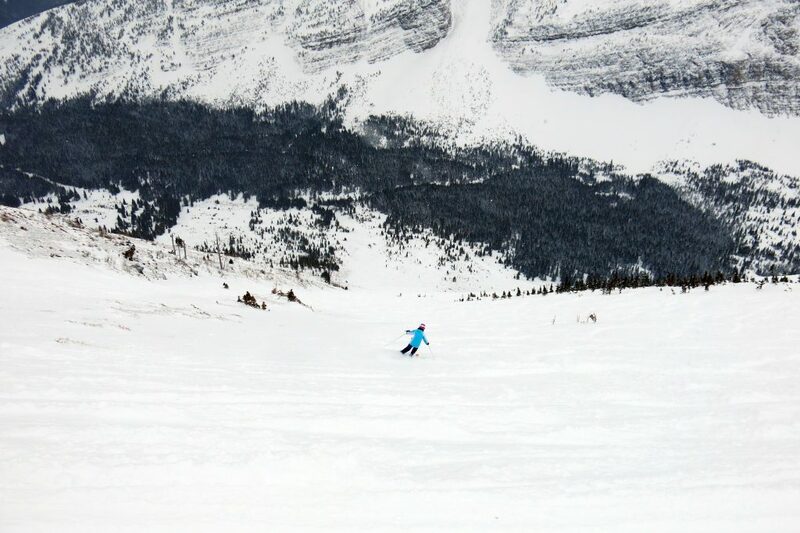 It’s a fun skiing culture with less emphasis on challenge and more on just getting out onto the snow and sliding around. 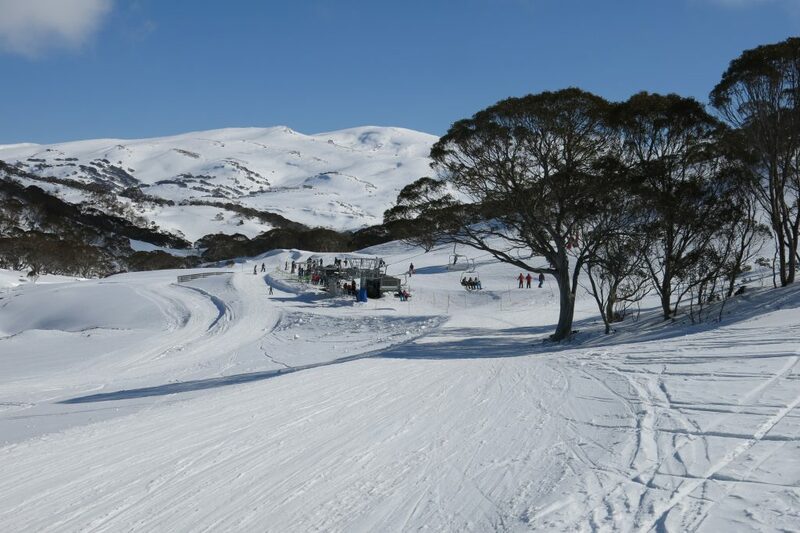 I would go back to Thredbo which I would rate at least 3 out of 5 stars on our scale. 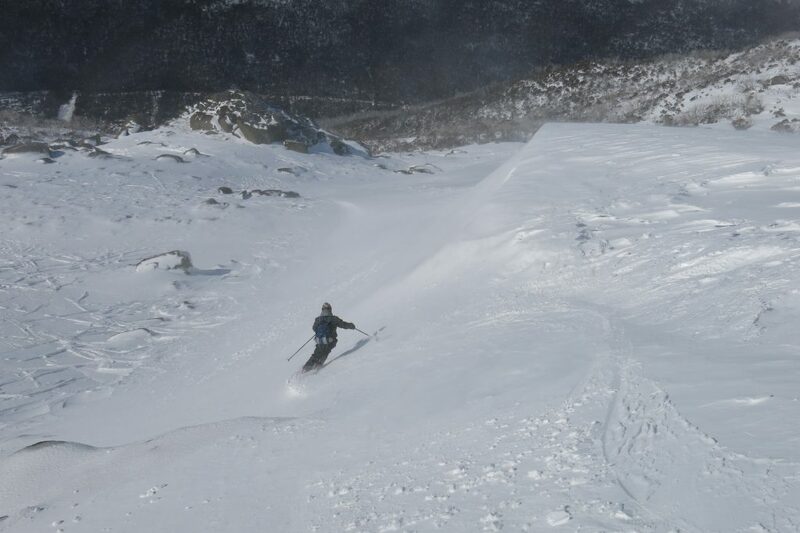 As far as choosing Australia over New Zealand for a summer skiing vacation, New Zealand definitely has better resort skiing at Treble Cone, but I’d rather ski Thredbo over the other major NZ ski resort I skied at which was Mt. Hutt. 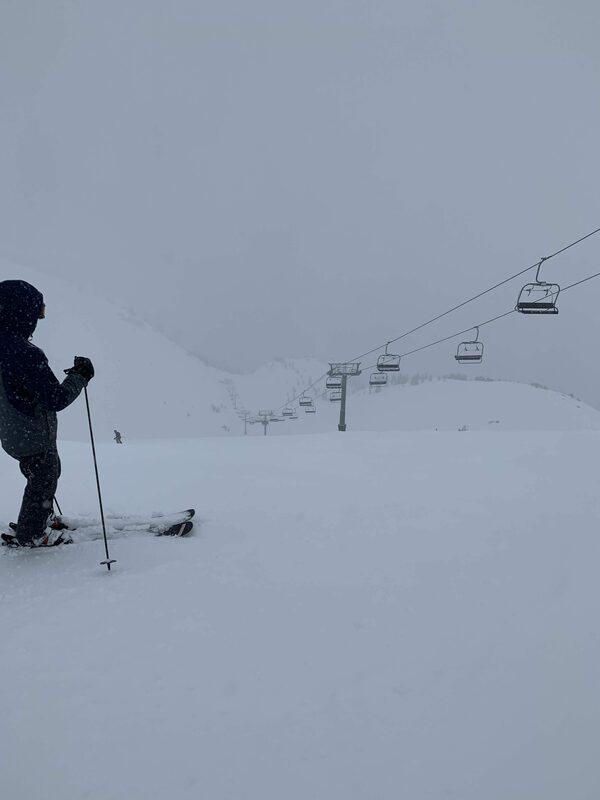 The thing that New Zealand has over Australia is really impressive mountains that you can only get to with a helicopter or by hiking, but the resort skiing is actually pretty comparable. Now that I have had my summer skiing fix, we are waiting for Winter in North America. I’ve been doing a lot of mountain biking to stay in shape. Hopefully winter provides us with deep snow and cold temps, but even if it doesn’t we are certain to have a good time. 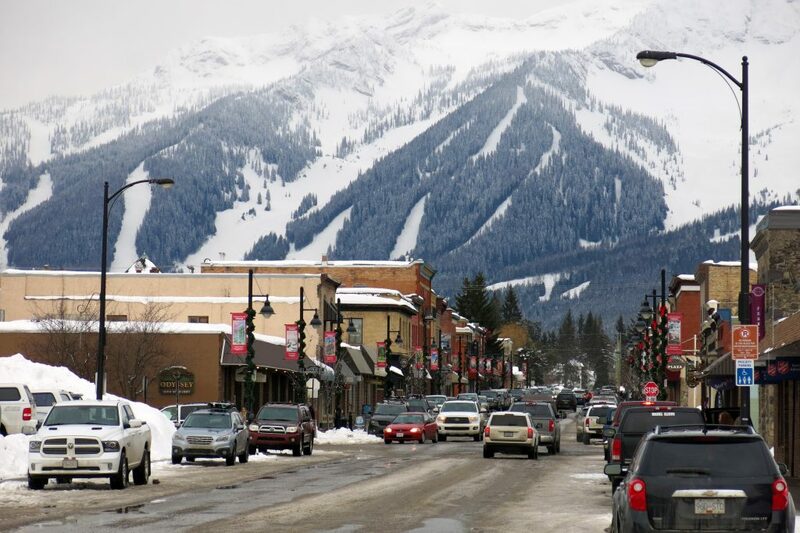 We have already booked our Whistler/Blackcomb trip for Christmas and are also planning to go back to Telluride and my old home town Crested Butte in March. Can’t wait! This entry was posted in Uncategorized on August 22, 2018 by Ron Thompson. The end of our ski season has arrived so we will reluctantly hang them up and reflect on what was our best year ever! Records were broken, and some great memories were made. Kirkwood closed on April 8th and Heavenly on the 22nd, so this last weekend was the first time I was not skiing and was home in Fremont since mid January! Total ski days this year were 55 for me and 38 for AiRung. This is a record for me and ties a record for AiRung, which is all the more impressive because December, January, and February were way below normal snowfall in Tahoe. 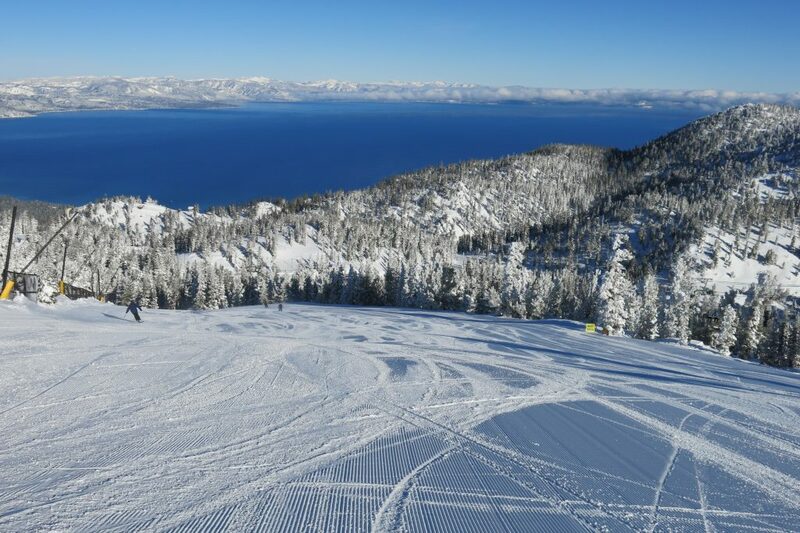 At the end of February we were flirting with record low snowfall, but then we got another one of those Tahoe “Miracle March’s” which provided some awesome powder days. In fact March 17th at Kirkwood was the deepest inbounds powder I’ve ever skied. 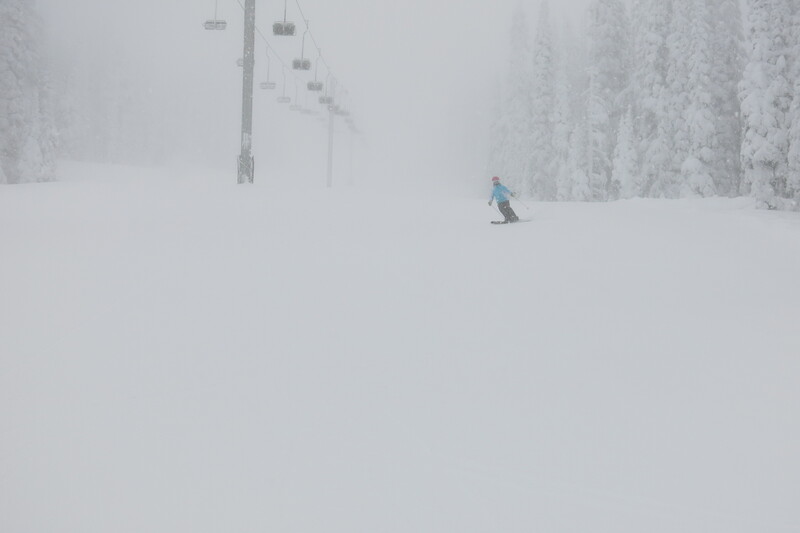 74″ fell in 2 days, and it was super cold, which made for light blower powder like you would find in the Rockies. Neck deep isn’t an exaggeration! 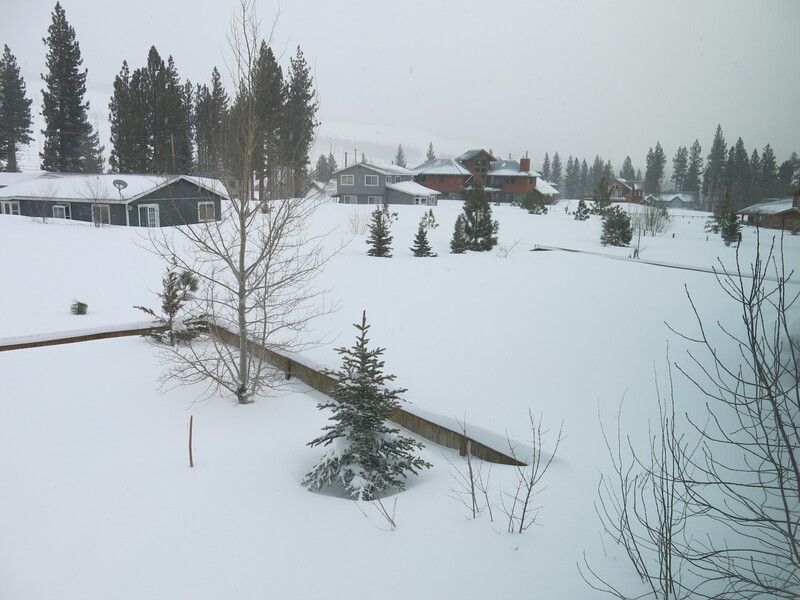 The snowfall continued well into April and both March and April had much higher than normal snowfall and colder than normal temps — just what we needed. The season ended up with about 75% of normal at Kirkwood and Heavenly which is something I never saw coming at the end of February when we were somewhere around 30% of normal. 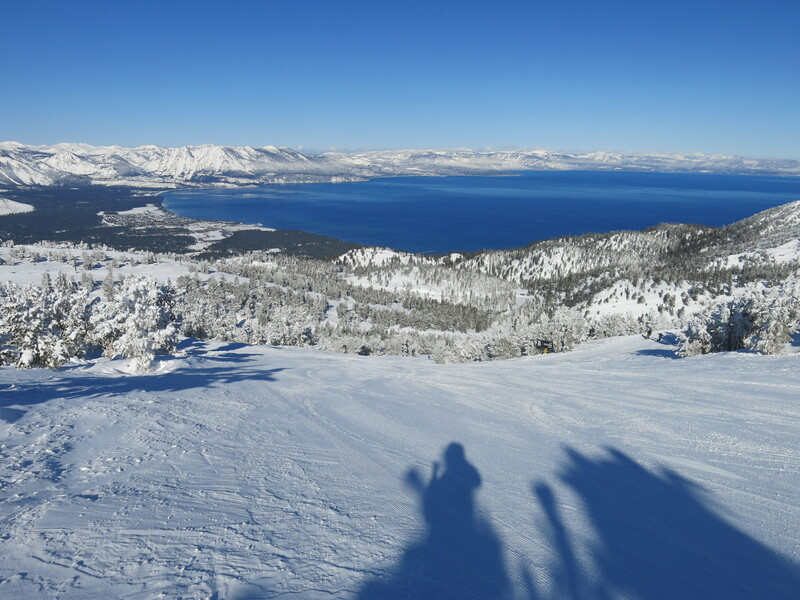 I skied closing day at Sierra at Tahoe which featured 15″ of fresh and lots of tree skiing. 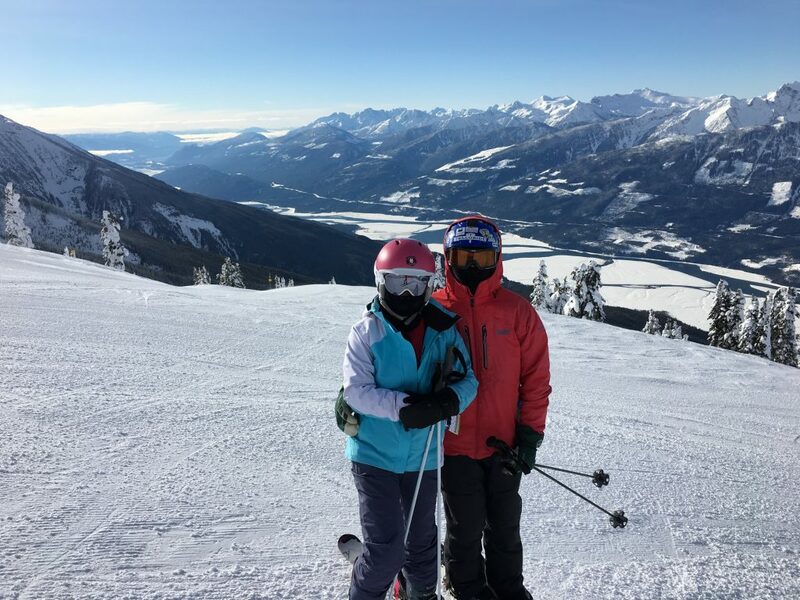 We had the best ski trip ever this year which started in late January and lasted until early March courtesy of my 5-year sabbatical from Adobe (see the previous post). 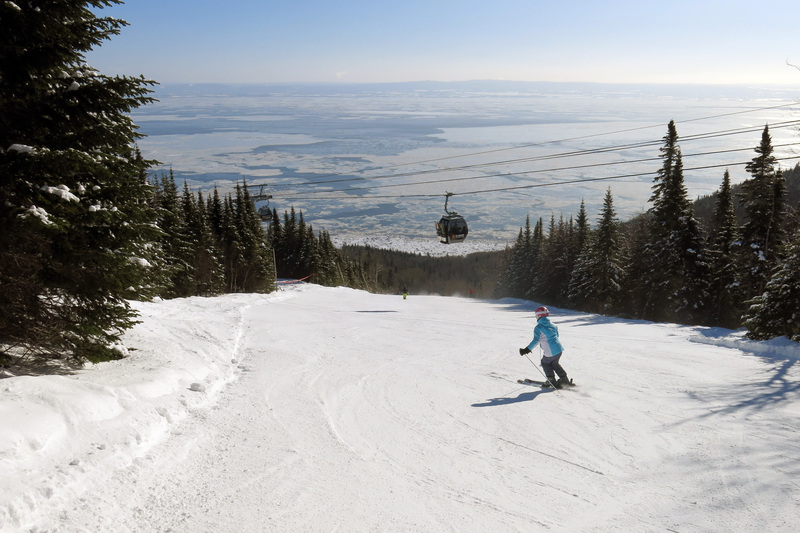 We skied a record 11 new resorts from the far west coast (Stevens Pass) to the far east coast (Le Massif). Trips like that are what we live for. 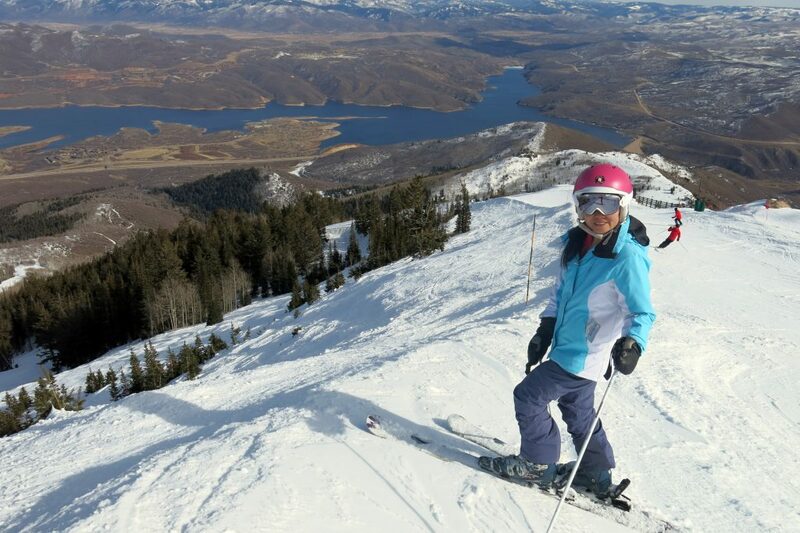 As usual we spent about 10 days skiing with AiRung’s family in Tahoe and Park City. This is a lot of fun for us because they are now able to ski just about anything and can follow us all over the mountain. The planning is now underway for next season when we will hit some of the remaining resorts we have to do in Colorado including my old hometown Crested Butte. Can’t wait! This entry was posted in Uncategorized on May 2, 2018 by Ron Thompson. 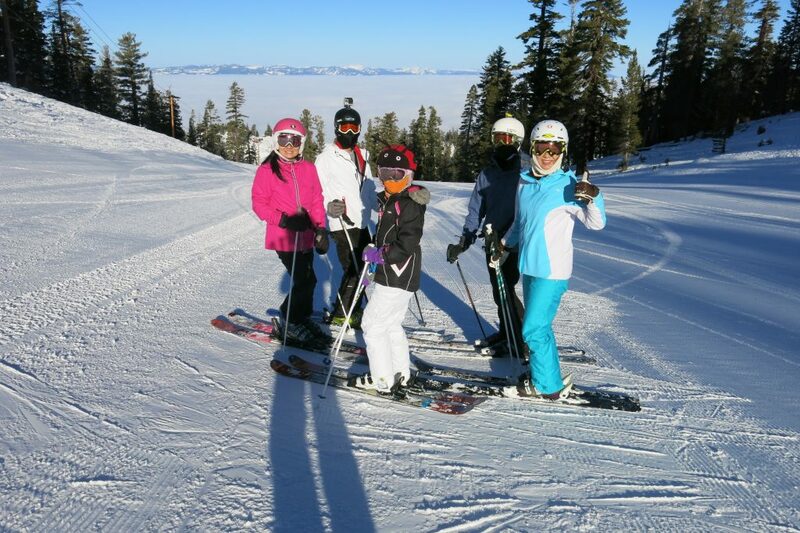 AiRung’s brother and his wife and 2 kids visit us each year from Taiwan starting in late January for an extended ski vacation in Tahoe. They get better and better each year, and now they can ski just about anything so it’s a lot of fun playing the guide and skiing with them. 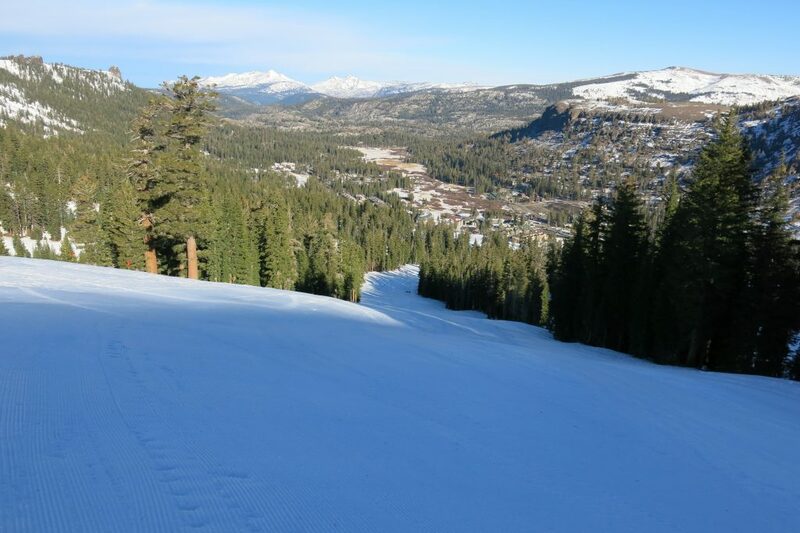 We started with 5 days at Heavenly, 2 at Kirkwood, and even a day of XC skiing at the Kirkwood XC ski center. After Tahoe, we headed over to Park City / Canyons for a change of scenery. 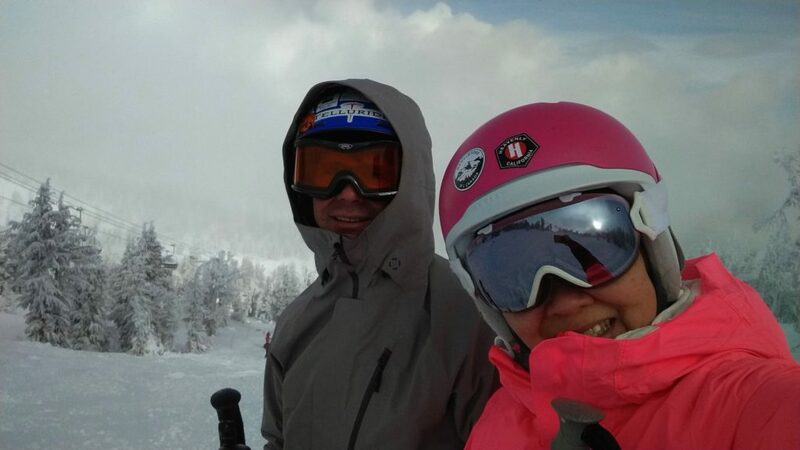 Our Vail Tahoe Local passes give us 5 days at Park City and we usually ski 3 days there every year if we have time. This year Utah has had historically bad snowfall, but it was still a lot of fun. We liked it so much in fact that we were scheming of ways to spend the entire winter there after we retire! The last day AiRung and I were on assignment for Snowpak.com doing a piece on Deer Valley, with free tickets that they arranged. 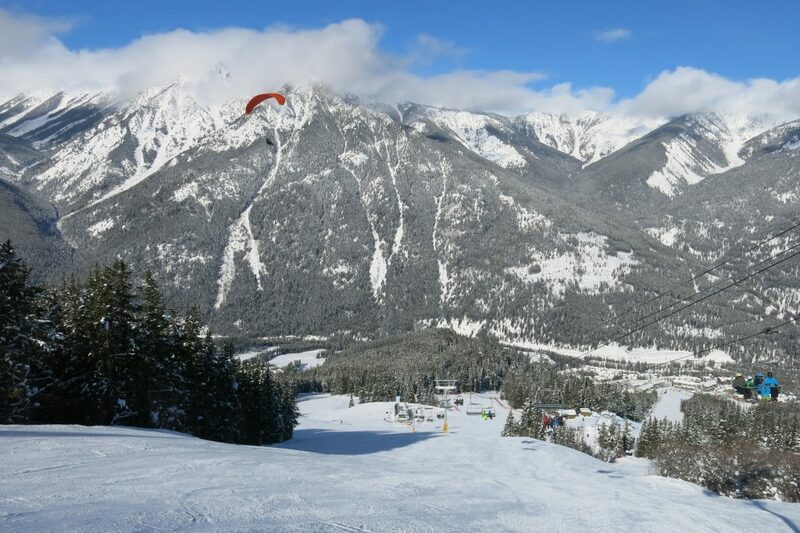 It had been several years since we skied there and we had our opinion of the place improved significantly. Deer Valley has remained true to its mission of quality, whereas nearby Park City/Canyons Village has just gotten more crowded and expensive under Vail ownership and has lost some of the unique culture that used to exist there. There is also evidence of cost cutting with reduced grooming vs. what we saw years ago. 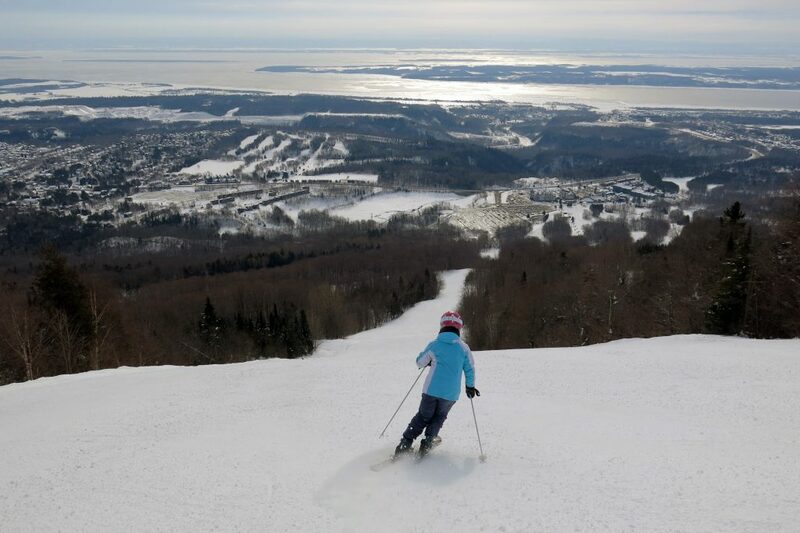 After Park City, we flew to Montreal, Quebec to ski the 3 Quebec resorts on our list. Travel was even more difficult than normal due to weather and airline issues. We had a connection in Toronto and there was one of the worst snow storms of the season going on when we arrived. We finally landed after circling around to burn off excess fuel for an hour or so and found that our next leg to Montreal (a 1-hour flight) was delayed by 5 hours. We had a 2-hour drive to Mont-Tremblant that we didn’t even start until 1:30AM, with snow-packed roads the whole way. We got to bed at 4AM and got up at 8:30AM to ski in a daze. Coming back wasn’t any easier because we got kicked from our flight due to high winds that meant the plane couldn’t fly full of people and luggage. We arrived back home at 2AM (5AM Eastern time), again deprived of sleep. The things we do for the project! 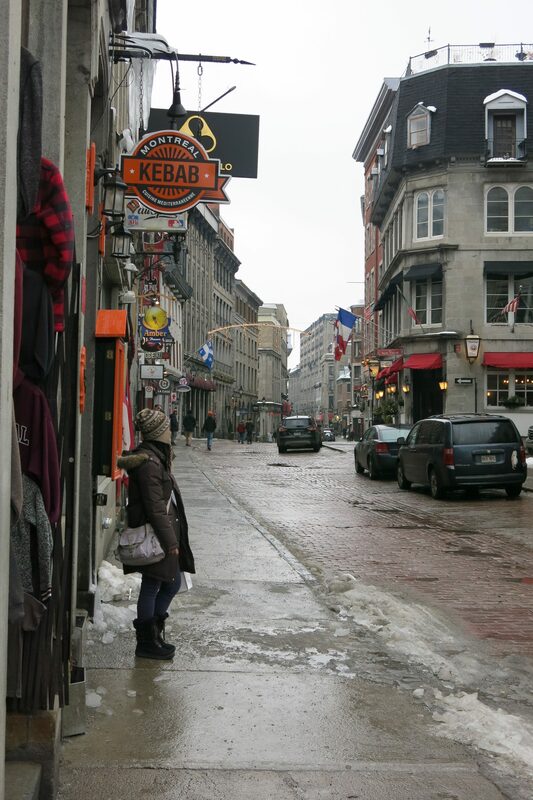 Quebec is very interesting but is definitely not our first choice as a destination for skiing. The resorts are impressive on paper, but the reality is that the weather is unpredictable and has a big impact on the experience. We encountered rain, snow, sleet, wind, and icy cold but even with all that we did really enjoy our days at Le Massif and Mont-Sainte Anne. Other than Tremblant, just about all the skiers appeared to be locals, so that is a good indication that these are not really destination resorts that would match up to the usual places people travel to in the west. The few people we talked to were shocked that we had traveled from California to ski in Quebec and one guy went on and on about how he really wanted to move to California as his #1 choice in the whole world! On the positive side, the food in Quebec is awesome, and if you like steep groomers like we do, this is your place. Just sharpen your skis before going, and bring your warmest clothes! So mission accomplished with 3 of the 10 eastern resorts on our list done. Now we are up to 27 days on the snow for Ron and 21 for AiRung. Next up we are heading up to interior British Columbia for the last leg of our 5 week tour. This entry was posted in Uncategorized on February 18, 2018 by Ron Thompson. 2017/18 is underway with a slow start, but we have a lofty goal of 12 new resorts this season so we will be very busy in the coming months! 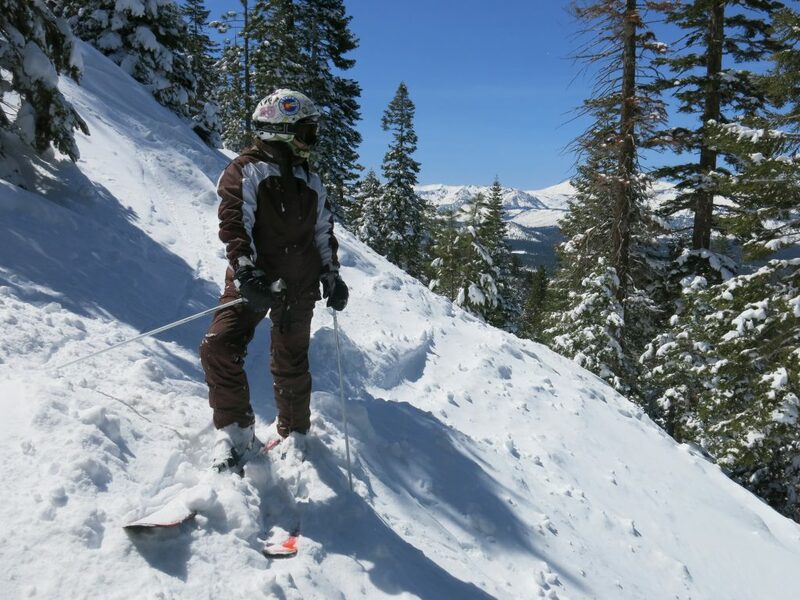 Our home resorts in Tahoe had slightly above average snowfall in November which allowed Kirkwood to be almost 100% open by Thanksgiving weekend, but the snow machine abruptly shut off in December with only 6″ falling in the whole month. There was enough snow for some good days before Christmas, but we could really use some more. Both Northstar and Heavenly are operating on very limited terrain on basically 100% snowmaking at this point. Heavenly is reporting 200 acres out of the 4800 that they had open by mid January last year. Every year between Christmas and the New Year we take a trip where we travel to ski 2-3 new resorts. This time we decided to ski the last 2 resorts on the list in Washington. This was actually planned a few months ago when we saw that the winter forecast was for La Nina conditions with above average snow in the Pacific Northwest. That’s exactly what played out with heavy snow north of Portland, so the trip was on. We also wanted to try out our Escape trailer for winter camping with our dog Sammy so we hitched it up and headed up I-5. Out of the 6-days we were gone, it rained or snowed non-stop for more than 4 of them. This was definitely not ideal camping or travelling weather! Our first stop was White Pass, which is a smallish resort in the central Cascades. After skiing there we had an ambitious plan and short timeline which required us to ski Stevens Pass the next day to keep on schedule. It’s more than 180 miles and a big storm was underway and we had some of the worst driving conditions I’ve driven in in years. After we miraculously safely reached Stevens Pass we still had to make it the last few hundred yards up a steep hill to the RV parking lot. This is when we realized that the Honda Pilot 4WD system is not up to the task of pulling a 3,000 lb trailer up a hill in deep snow. I ended up trying various configurations of chains and the one that finally worked was one chain on one of the front wheels. 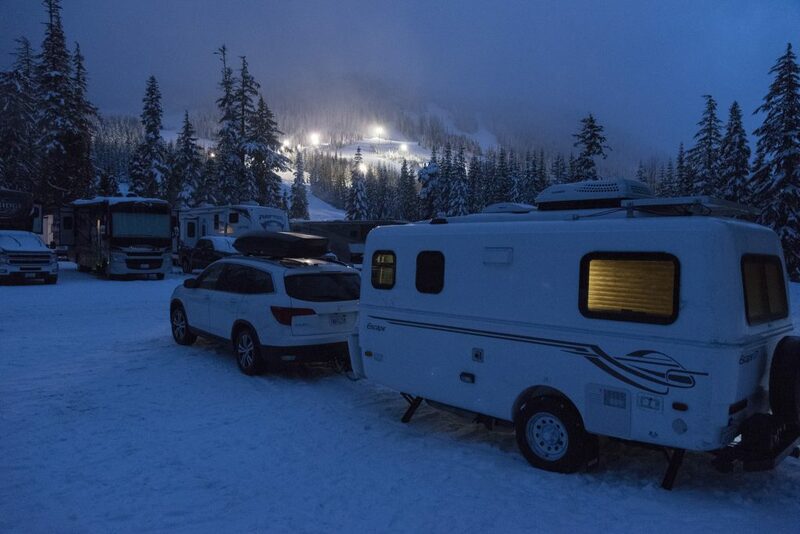 Our night in the parking lot at Stevens Pass was not peaceful with constant noise from the snow removal operations going on to keep the parking lot clear for the next day’s skiers in the heavy snow that was falling. Early in the morning the avalanche bombs started and this caused our dog Sammy to hide under the bed. We did ski and had a pretty good day, but we were very happy to descend out of the snow on our way to Seattle at the end of the day. So thus far I have 9 days of skiing and AiRung 7. Next up we have a trip to Park City in early February. From there we will fly to Quebec, Canada to ski the 3 Quebec resorts on our list. When we get back from that we will drive up to interior British Columbia to ski another 7 resorts up there on a 16-day driving trip. This is going to be fun! This entry was posted in Uncategorized on January 4, 2018 by Ron Thompson. This was a record-setting winter in Northern California which received the most rainfall ever recorded since records have been kept. 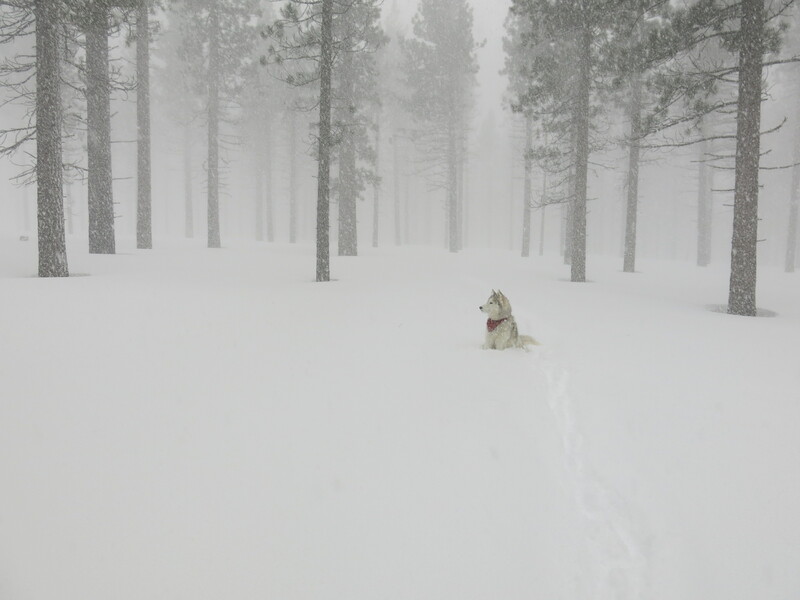 This translated into a LOT of snow and Tahoe got the most snow of any place in North America this season. Our home resort Heavenly received almost twice as much as normal at 639″, obliterating the previous record of 500″ set in the 10/11 season. Just getting around was a challenge at times. One Sunday in March we had some great powder skiing at Heavenly and then spent the next 1hr 45m driving 6 miles back to our house in a blizzard with gridlocked traffic. Snow removal was difficult and we saw snow piles over 30-feet tall in the Kirkwood parking lots. Heavenly had parking challenges all season because there was no place to put the snow. 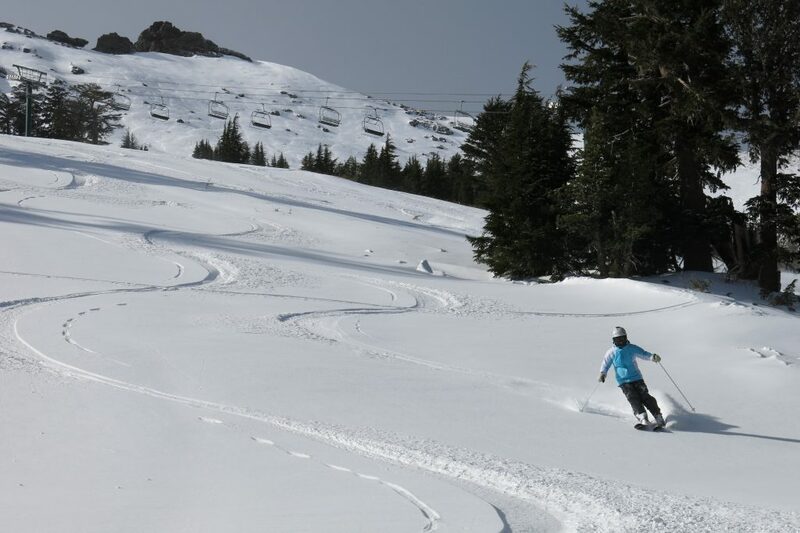 It kept snowing in March, April, and May, so we kept skiing powder. 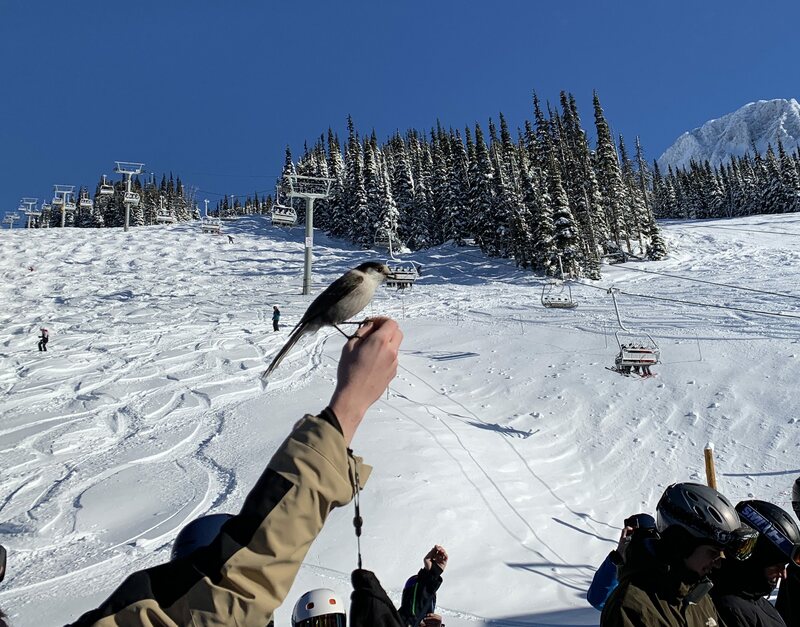 April provided the best powder of the any month, and the massive crowds attracted by the record snowfall eased up making for the best skiing of the season. Kirkwood closed really early on April 16th with the deepest snowpack in the past 6 years still on the ground. 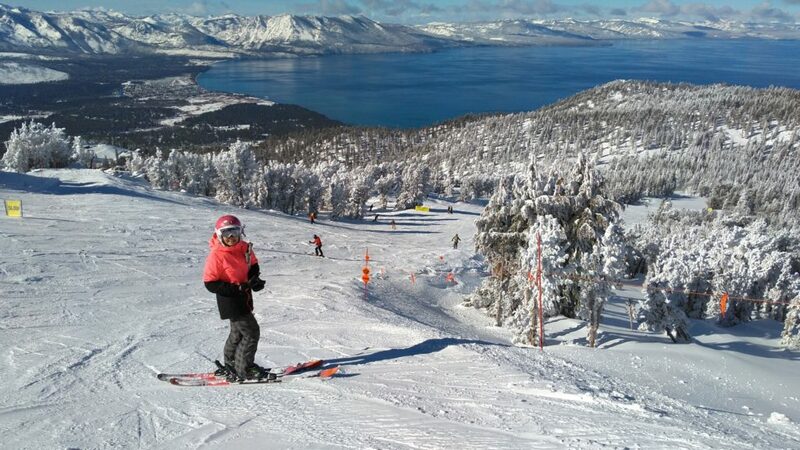 Heavenly opened one additional weekend so after they closed we had to head a bit further afield to keep skiing. We had a great day in mid May at Mt. 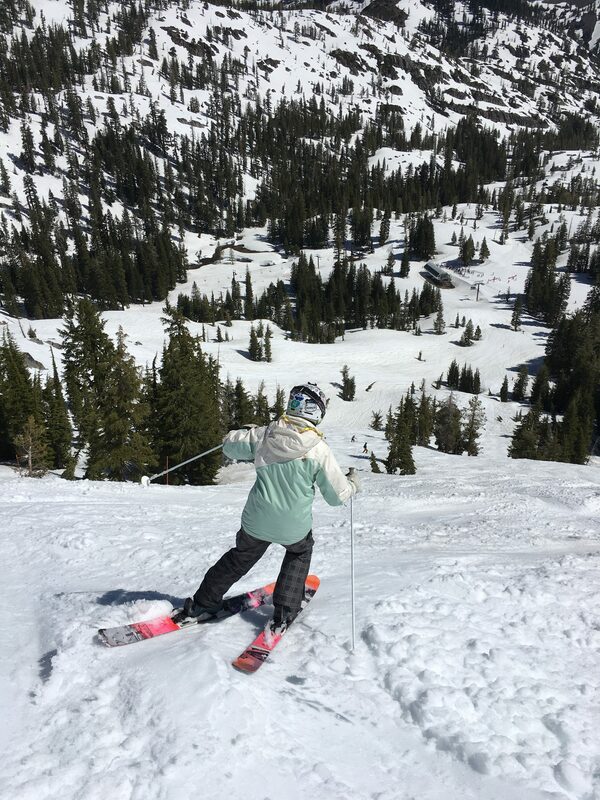 Rose, and then the best Memorial Day skiing we’ve ever had at Squaw. Amazingly, the Mountain Run and KT22 were still open (6,200′ elevation). It was interesting skiing past Aspens in full summer leaves and green grass at the bottom of the mountain. For only the 2nd time in my 48 years of skiing have I skied the July 4th holiday, and we actually did 2 days. 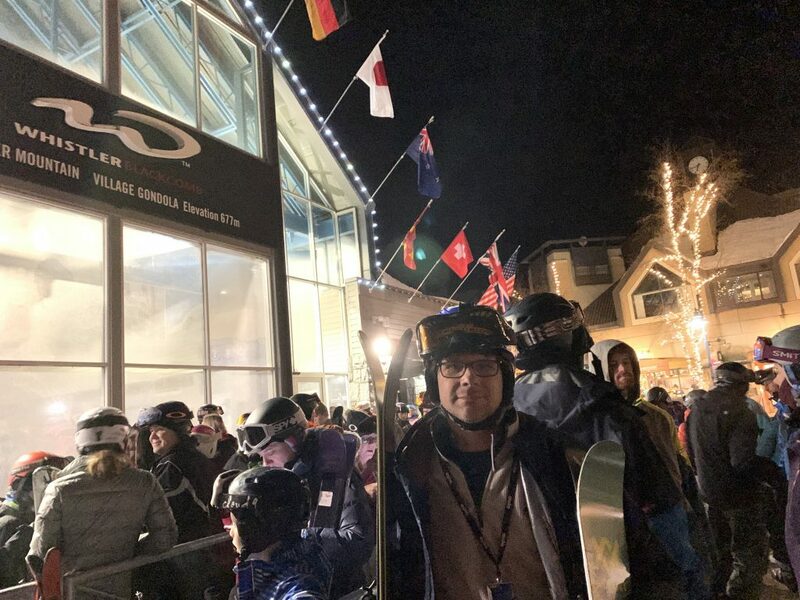 It was AiRung’s first time skiing that late. 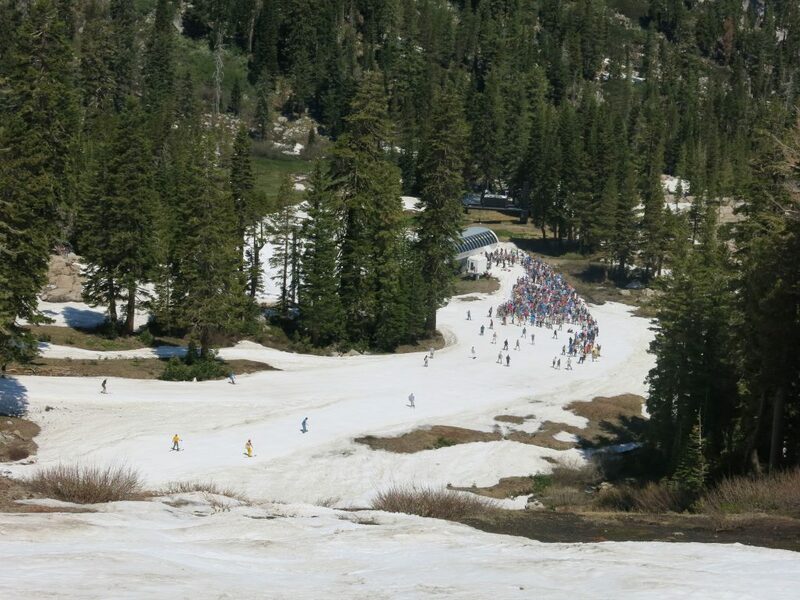 July 3rd we went back to Squaw where there were massive crowds on the limited terrain. The party atmosphere was a blast though. 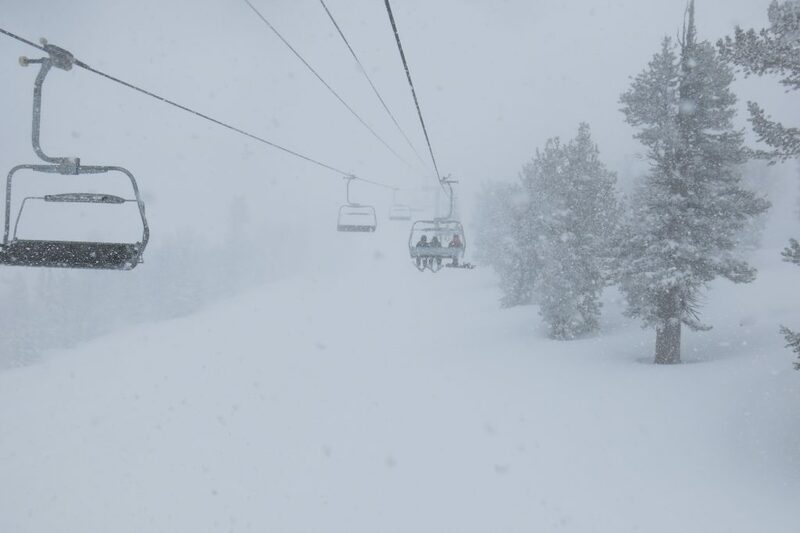 On July 5th we wrapped up the season at Mammoth. 2,000 vert of skiing on about 25 runs with no crowds and firm snow was so much better than Squaw. 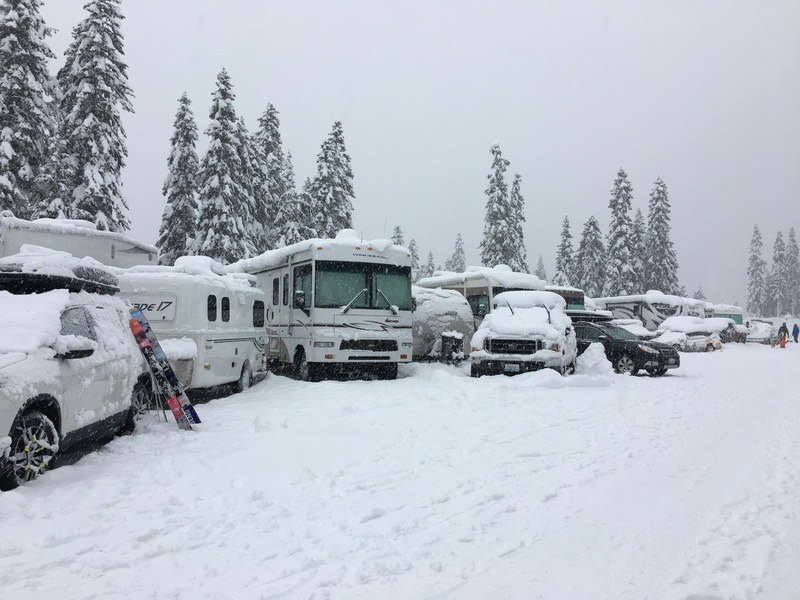 We camped in the RV park with our trailer and dogs, and were able to park the trailer in the Main Lodge parking lot, which was a good test for next winter when we plan to use it on our Big Trip. They open early at 7:30AM this late in the season so we had breakfast in the parking lot and then skied until 11:30 which was 30 minutes from closing. So the final tally for this season was 9 new resorts, 51 days for me, and 38 for AiRung. We met a ton of friendly people and experienced some resorts and adventures we never would have if not for The Project. 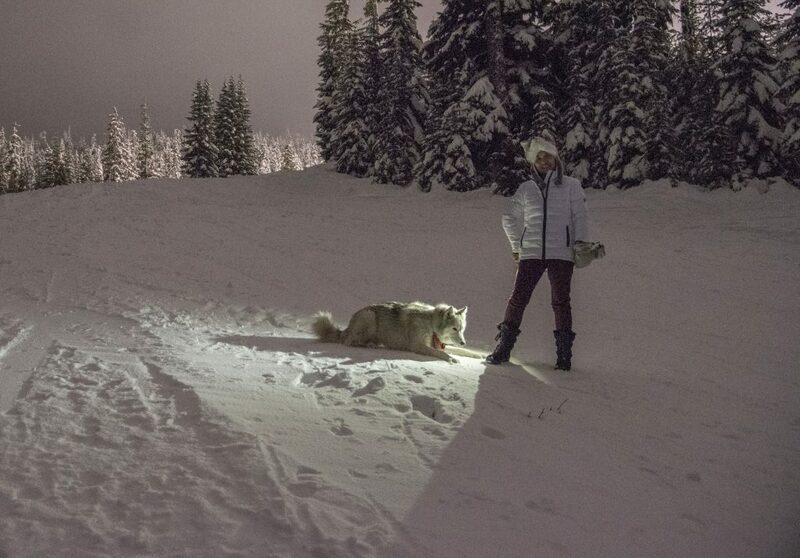 A few highlights were Apex Mountain, Sun Peaks, and Silver Star in BC, Canada, night skiing at Mt. 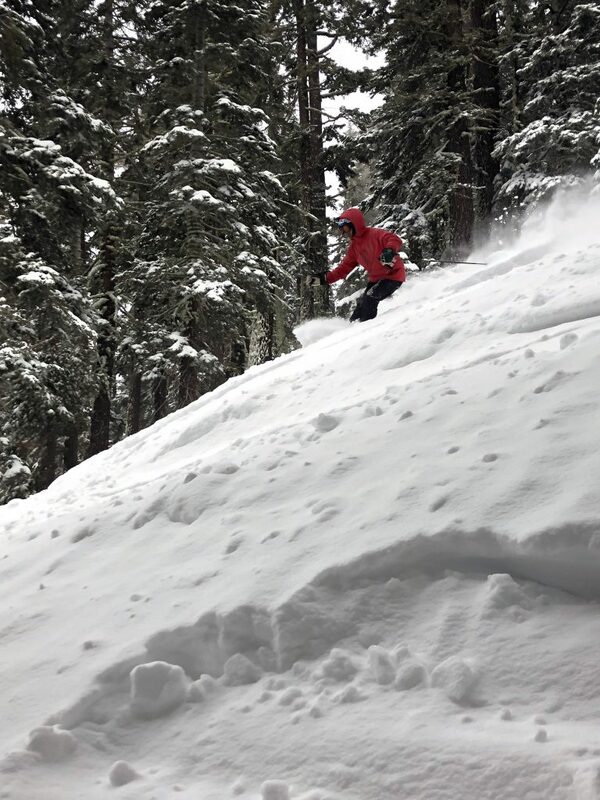 Hood Skibowl in Oregon, and powder skiing on runs like “Hogbacks” (below) that are seldom skiable (and never good) at Heavenly due to the record snowpack. Our normal ski day in Tahoe starts early so we get to the lifts just as they open. For Heavenly that’s 8:30. 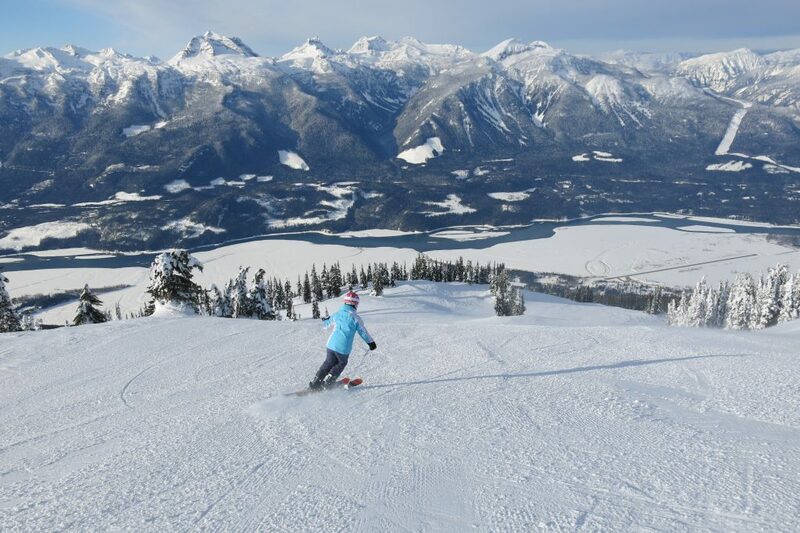 We can get a few runs in before the crowds get large and we usually only ski until 1 or 1:30PM. After a quick lunch at home, we head out with Sammy for X-C skiing in the neighborhood. This year we could X-C ski in our neighborhood almost continuously from the beginning of December until mid-April. In drought years past we might only be able to do a few select days, so this was something very special. The first snowfall was October 1st and the last was June 11th. So now we need to wait out summer and start planning for next year. 64 resorts are done and we should make serious headway next year because we are planning to take a whole month to knock off some of the more distant resorts in Montana, Idaho, and B.C. Can’t wait! This entry was posted in Uncategorized on July 20, 2017 by Ron Thompson.